In my case, my exquisite corpse/found poetry turned out to be an inadvertent collaboration between KitoBito, a small Japanese woodworking company specializing in kitchen designs; Google translator; and myself. 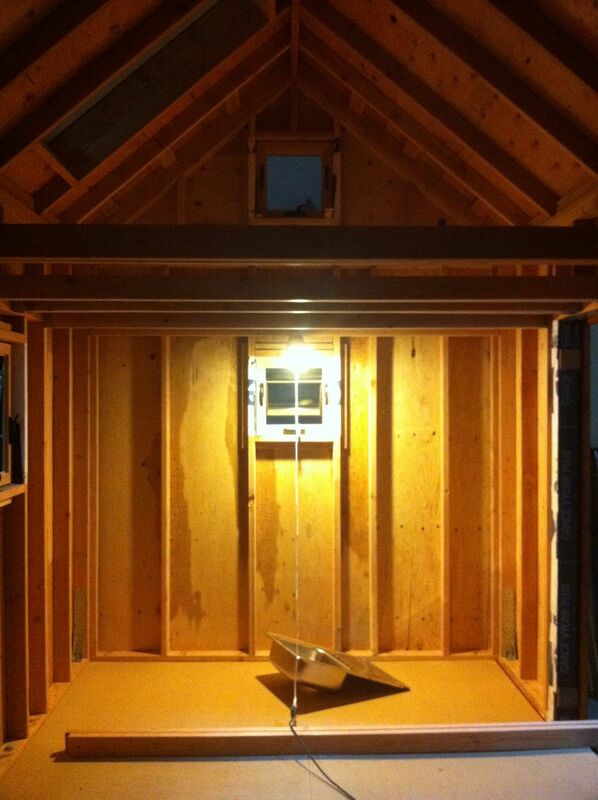 As I was recuperating and unable to build (see below), I spent time researching my cabinet design. Through a random search, I ended up on KitoBito’s site and fell in love with their work. But beyond giving me inspiration for my own designs, I made a delightful discovery when I saw what random beauty and thoughtful word play was being generated by the Google translator! While enjoying a serious loitering, various colors of kitchen and furniture skeleton will be completed… Life even if also painful, satisfaction at the top of the feeling of in such a thing, I was also confident that it would become manure is for sure the future of their own… Pull for me tightening crisp facial expressions is basically uses the iron. Is impregnated only a little like the worn-out handkerchief of oil, please let them soak in as skin care. It becomes rust. You can also change the brass by hope also so hard to throw brass. But then, occasionally, the rather dubious translations came out mind-blowingly poetic. I copied some of the best of these down and played with arranging them in a more intentional format, with minor punctuation tweaks. These are what you see throughout the post in italics. I am no poet, and make no pretense of knowing much about poetry, but I do know what speaks to me, and these did. I love the magic that comes through these random happenstances, across language and cultures, filtered through the mock consciousness of a robot, into some semblance of wisdom. I hope you will enjoy them as much as I do. Location to advance the hand. while full of green garden. This was taken from a description of KitoBito’s workshop, built from trees on owner Masayuki’s father’s nearby property. Like the others, it’s been run through the vagaries of the Google translator, but I love how it captures a sense of rightness of place and the intertwined nature of the woodworker and the environment! I can so relate. After years of living in the city, I am loving living in the country. Last fall we planted a number of trees for both privacy and to provide wind breaks from the massive gusts that come barreling through most days. It made me so happy to see them framing my future parking spot. Two weeks later, we had a deep freeze with sustained near zero temps and most of the young trees turned distressingly brown and dead-looking. It was agonizing waiting through the winter and spring to see if they would bounce back. We had to replace a few, but most look like they will make it! 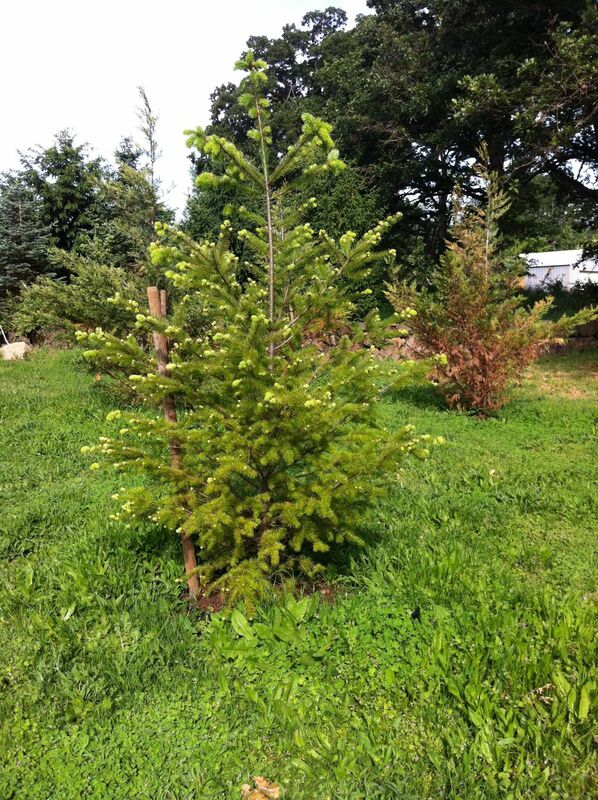 Some of the trees we planted, recovering. I’m realizing just how connected I am to trees. I thought my heart would break walking around our freeze-injured patients, wondering if they would pull through. Maybe they are a totem for me as I try to find some kind of balance between my tendency to wander and my conflicting desire to put down roots. But they also represent growth and patience. They provide shade, food and homes to creatures when alive, and warmth and raw materials when they’re not. They are simply beautiful. Last fall I took several woodworking classes and further grew to appreciate trees and wood. 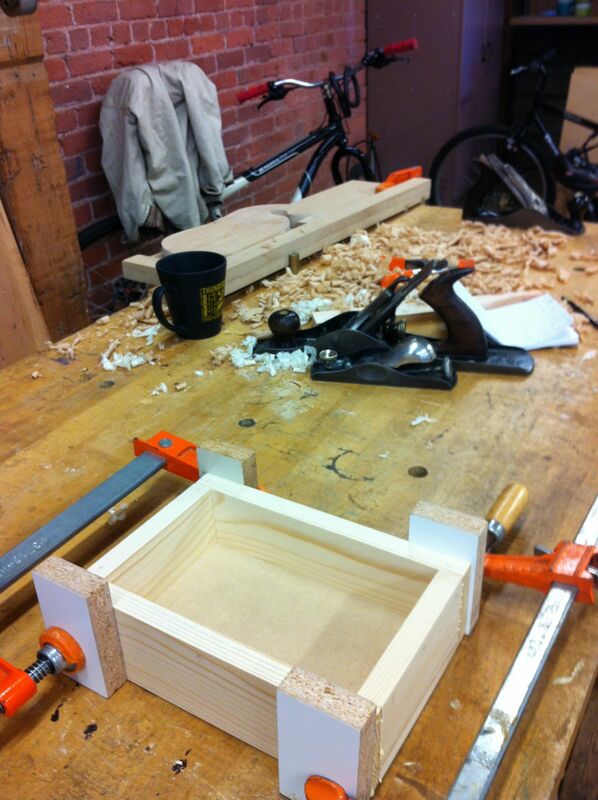 I wanted to learn to use both power and hand tools in preparation for building my cabinets, but also because I knew in my heart I wanted to work with wood, to spend the next phase of my life learning the art of it. 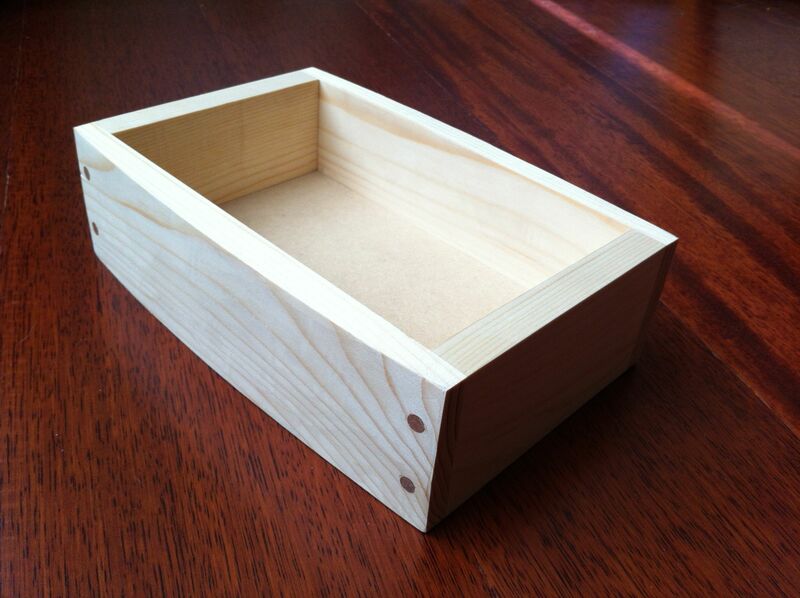 Learning to make a simple box. It is pine, nothing fancy, but I like the grain patterns. I took a week-long intensive class to make a work bench, learning how to do mortise and tenon joins, with and without wedges. 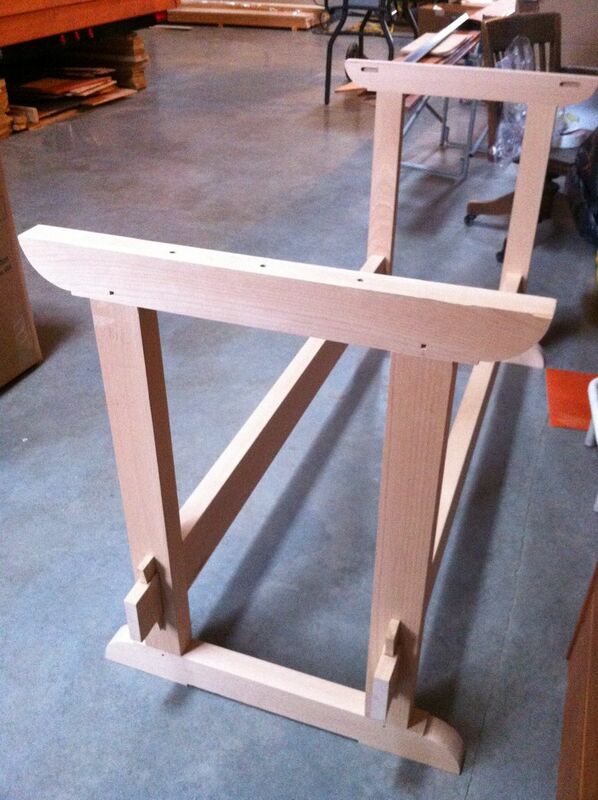 Work-in-progress, shaping the tenons on the rails with chisels and hand planes. 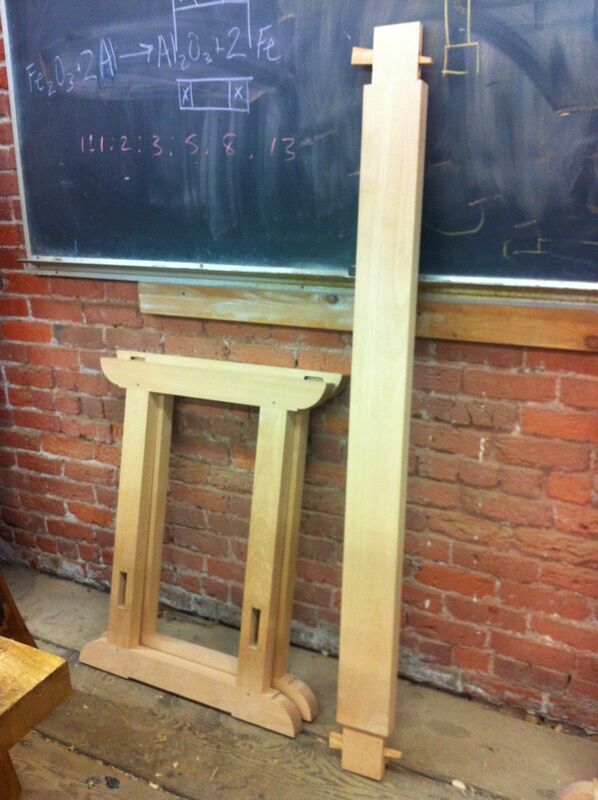 These were fairly complicated since they also had wedged mortises that had to all fit together. 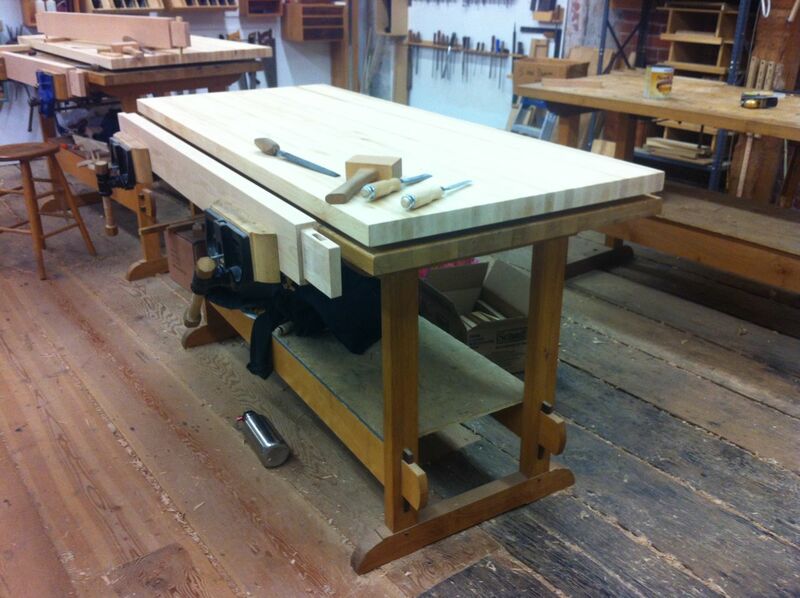 The future butcher block top is sitting on the type of work bench I was making. I’m mentioning all this as background for some of what I’ve been dealing with lately. Thinking back to exquisite corpses, let’s talk about this aging business! It’s probably just because I finally had time to go see the doctor about various things I had been putting off, but it seemed like I turned 50 and suddenly everything decides to fall apart. Growth rings of a sort? Source unknown. 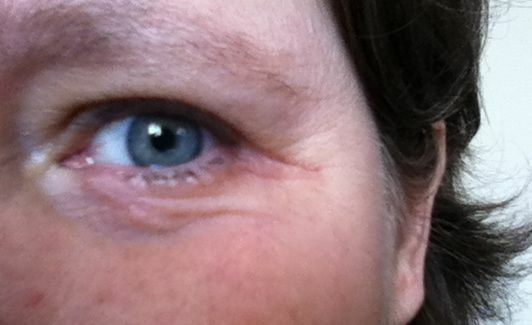 A bump I had on the inner part below my lower eyelid turned out to be a basal cell skin cancer. Fortunately it’s not particularly serious but because of it’s nearness to my eye, I had to go to one surgeon to have it removed and then to a reconstructive plastic surgeon to have it repaired. 24 stitches later, I was banned from building for a month. Blech. 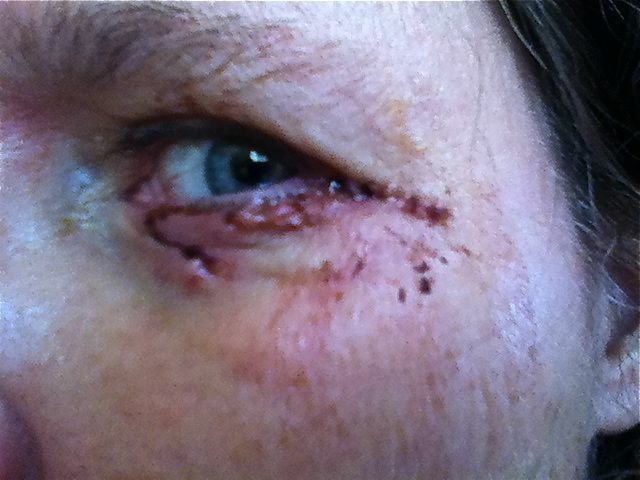 The plastic surgeon ended up cutting up from the wound site, all along beneath my lashes and out about a half inch from the outer corner of my eye to peel the skin back and stretch it to cover the wound. And I was awake for it all! This was taken after I took off the bandage I had to wear over my eye for a week (hated that). This explains my exhaustion last fall, when I had been working with cedar siding, one of the worst tree species for allergies, and also when I was taking my woodworking classes, all without wearing any kind of mask. Now that we have it fairly figured out, my life has gotten mostly back to normal. 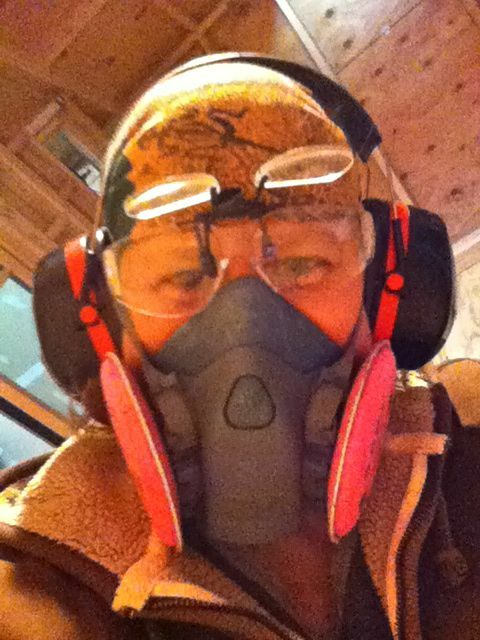 I take some medications and have to wear a respirator any time I work on the house, even if I’m not sawing anything. It makes me move even slower since there’s not a good flow of oxygen through the mask but I’m hoping it’s similar to training at high altitudes for the Olympics. Fortunately there should be a marked improvement once we’re through pollen season and the house is done (no pressure, patience, breathe, breathe…). As they say, aging is not for sissies. The bummer is what this means for my future plans in woodworking, but hopefully I can work around this little inconvenience. This has all been a little surreal since I’ve always been more or less healthy and really don’t feel like I’m 50 most of the time. It would be easy to get depressed, but I’m also learning you can choose to lean into it and look for those silver linings. As I go into below, the tiny house and the natural world have come through with some good life lessons in all of this. beauty when the month has passed. 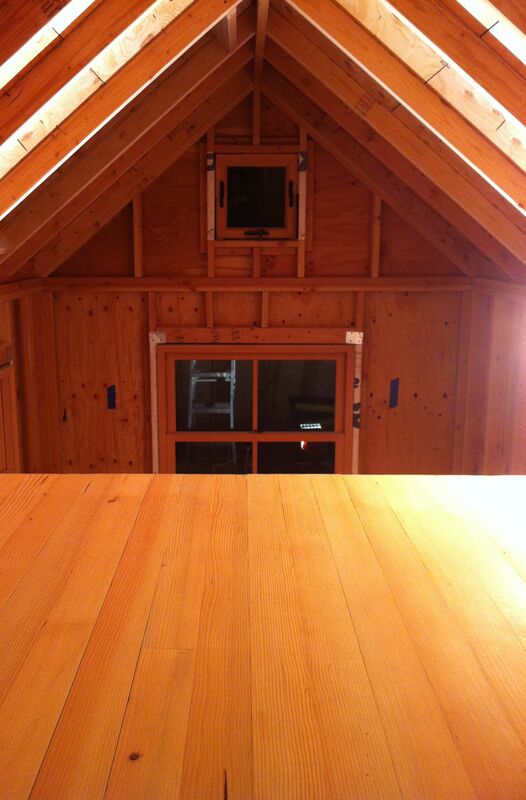 The color of the wood increases the depth in aging. taste comes out to scratch. Quietly and steadily persevering or diligent, especially in detail or exactness. I’m pretty good at the first one, less good at the second, particularly the bearing with fortitude and calm bit. My personal paradox is knowing that my greatest potential is achieved by being slow and methodical, but at the same time I’m incredibly impatient to get to where I’m going. My mind is always in the future, planning, dreaming, designing. Ever since I became interested in tiny houses, the one part I’ve been most eager to complete is to get the interior walls up. Partly this is because it is such a sure sign of progress toward making the house feel real, and partly I’ve longed for it because, though I know it will have its own set of challenges, it feels like it will be fairly easy and a relief from the brain-bending and skill-challenging aspects I’ve been dealing with up until now. I so want those walls up! I’m so close and yet it feels so far. 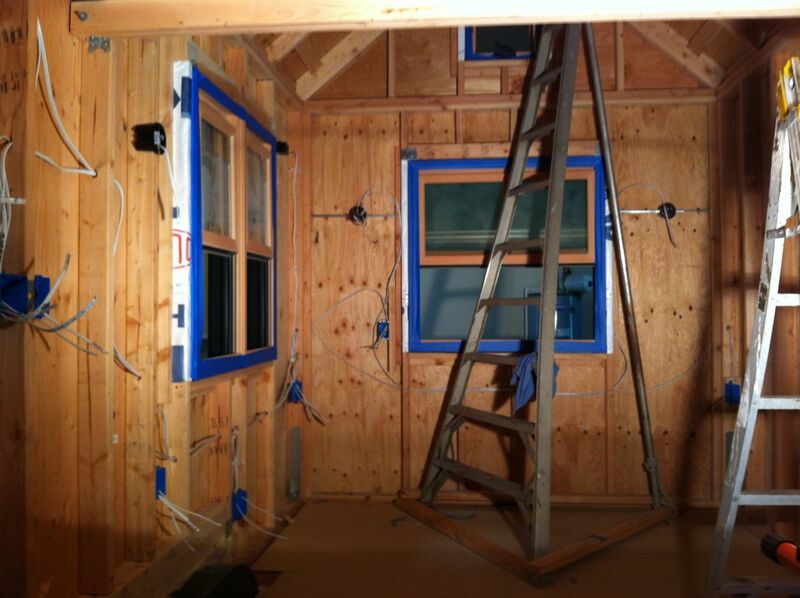 There seem to be interminable amounts of prep and details to work through just to get to the walls. And that makes me impatient. Well, sometimes the universe has to knock you upside the head to make you wake up. I’ve had a lot of time to dwell on patience and potential due to the host of health issues I’ve had to contend with. While this has been extremely frustrating, it could be much worse, and there are those silver linings if you look hard enough. Like the reminder that the best things in life take their own sweet time. 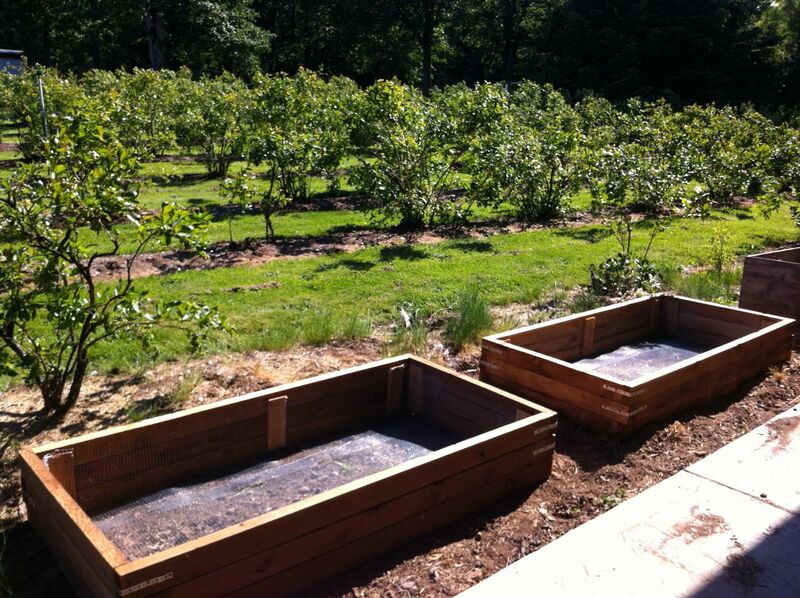 This spring we decided to build raised beds for vegetables. We put these together and I stapled screen along the bottom to keep out critters coming up from below. I loaded in several barrow fulls of dirt in the bottom, then we mixed compost, peat moss and vermiculite for the top half (not shown). 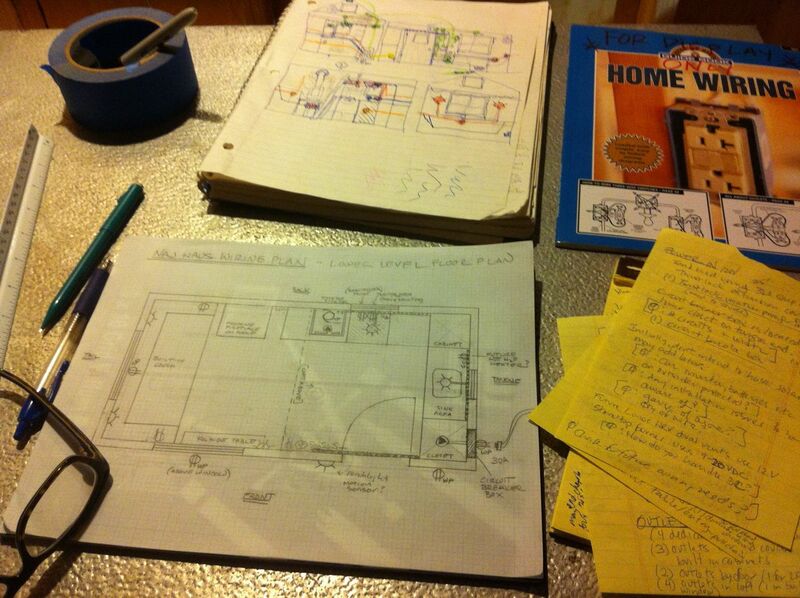 As I was laid up with my back, I decided that it would be a good time to come to grips with my kitchen design. I had the basic layout and vague ideas of style, but hadn’t made any specific decisions on materials, construction specs, or actual design. 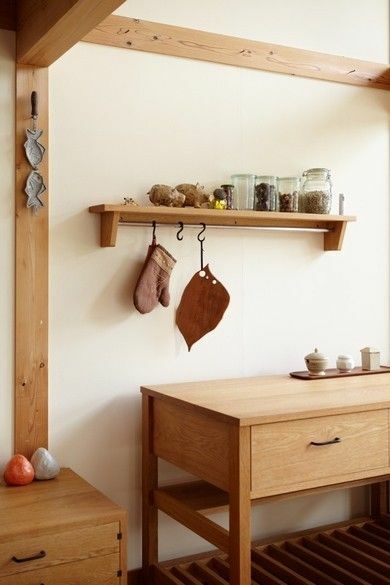 Curious, I did a Google image search on Japanese cabinetry and that’s how I got to the KitoBito website. KitoBito is an awesome name, meaning “trees and people”. It is run by Masayuki Yoneto, who is a master mortise-and-tenon joiner, and Michiko, who after marrying Masayuki, trained to become a woodworker herself. 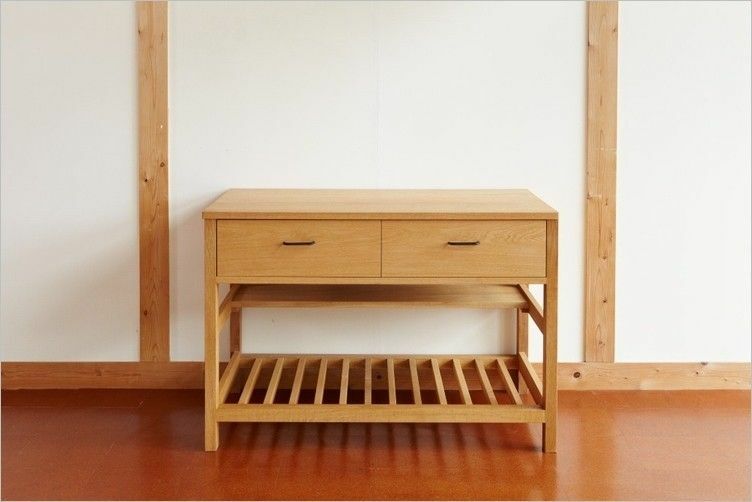 Located in rural Japan, they focus on sustainability and using solid wood pieces with traditional joinery methods. You can read more about them here. 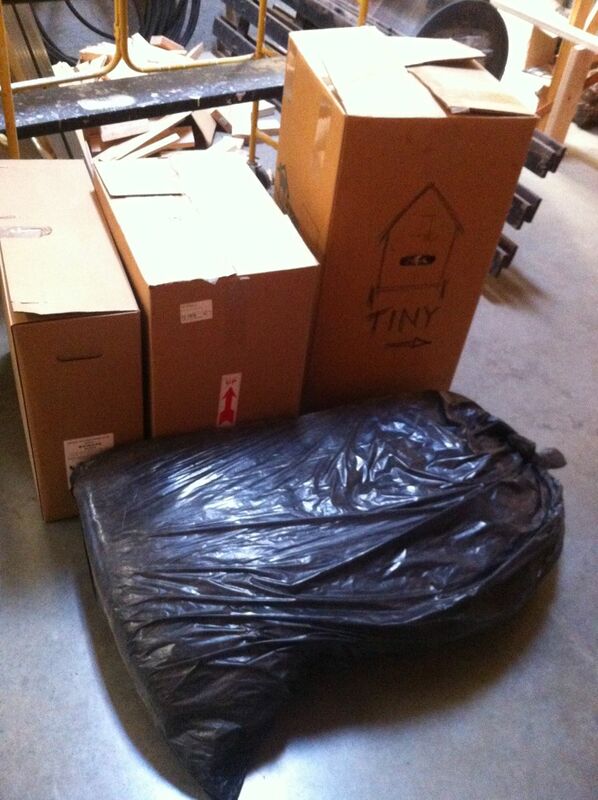 Furniture made in neatly polite innocence. What drew me to their work is the simplicity of it. They describe it as unaffected and sincere, while Google translator calls it neatly polite innocence. I love that. It would be great to have cabinets that are innocent, sincere, and above all, polite. I’ve always been drawn to the Shaker style of furniture and lo and behold, so are they. Both sides of the ocean influencing each other like the ebb and flow of tides. Their designs fit in well with the Japanese-Scandinavian-Shaker look I seem to be going for with Naj Haus and I felt a renewed creative surge and excitement as I went to work on my own designs. This was the silver lining of my back injury. It feels good to have made decisions on all of this so I will be able to move right into cabinet-building once the walls are finally up. 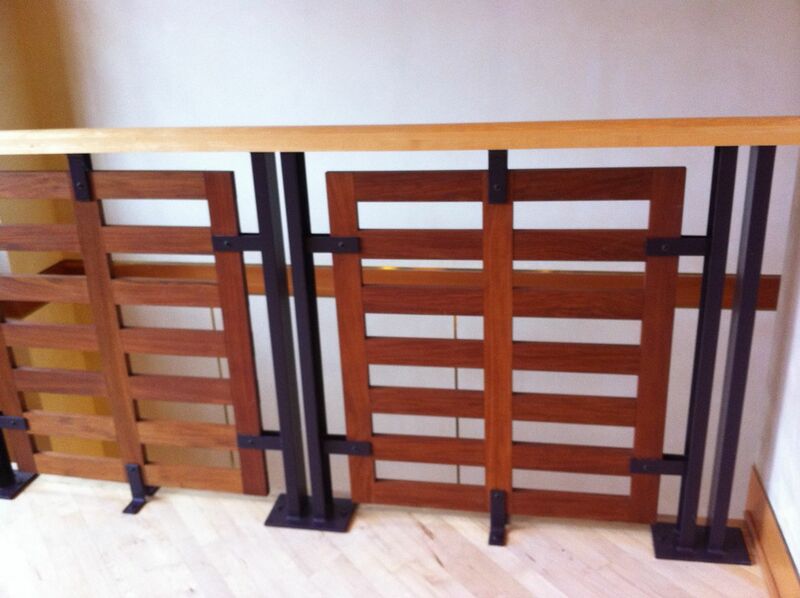 The silver lining of my eye surgery was this fine railing at my plastic surgeon’s! 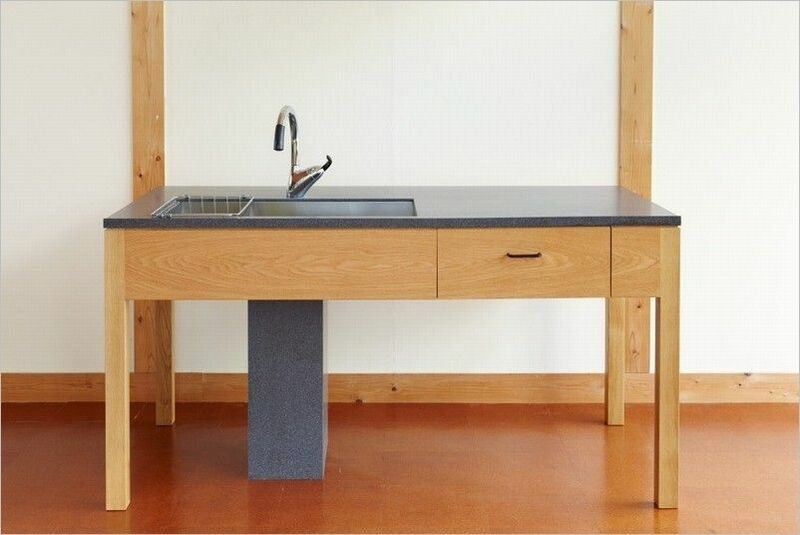 A sink pedestal and counter from KitoBito. 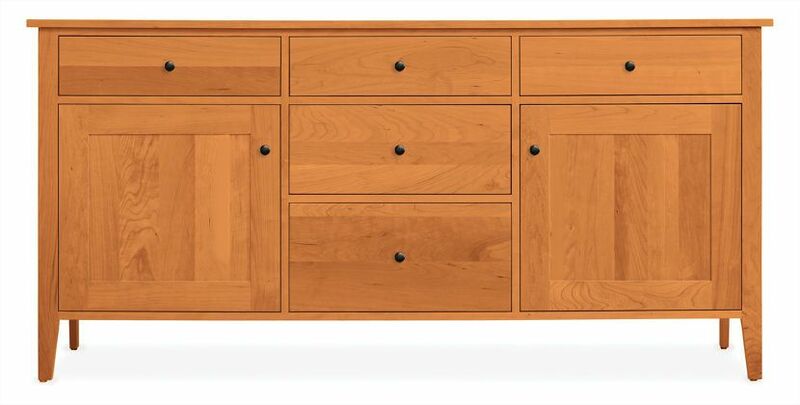 A Shaker-style buffet from Room and Board. Designing my cabinets and kitchen. I went back to paper and pencil for this, rather than SketchUp. It felt right. 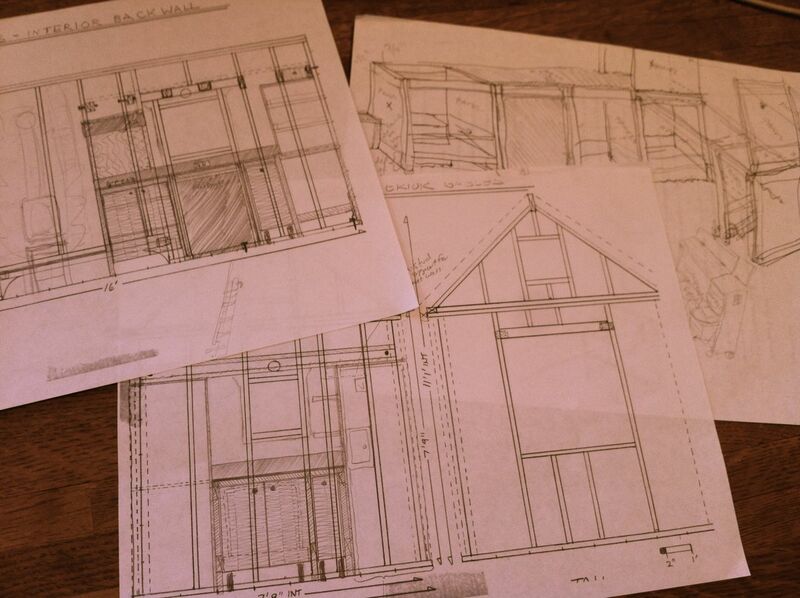 While the research into cabinet design was time well spent, sometimes too much planning can be a sign that you are avoiding tackling something you don’t want to do, or lack the confidence to do. This happened to me with the electrical work. 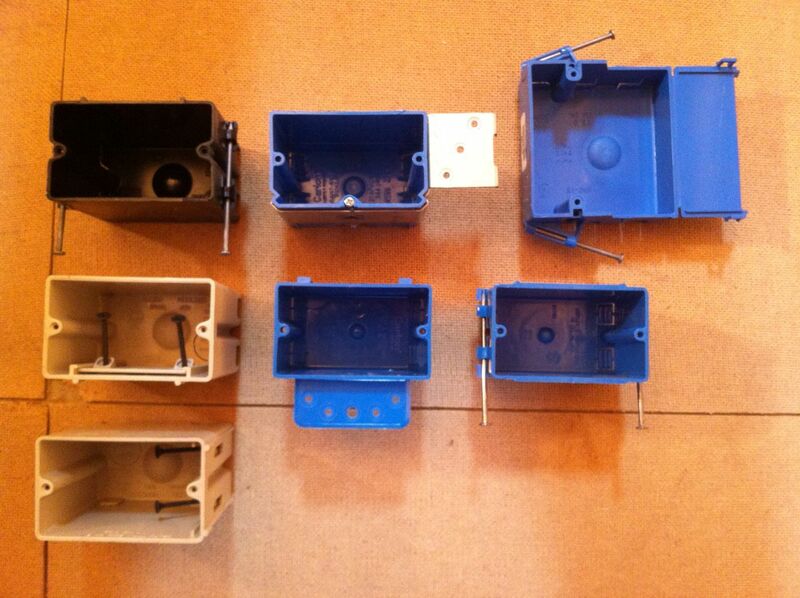 I had no intention of doing my own wiring, preferring to leave that to the experts. However, it turned out to be more money than I wanted to spend and I was faced with doing it myself. 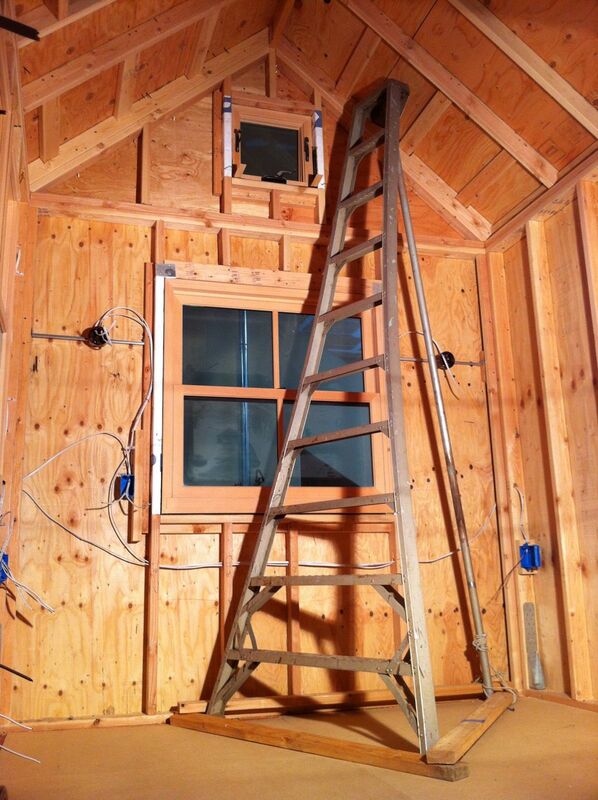 I was extremely fortunate to find Todd, a master electrician willing to mentor me along. Now I had to get serious. Lighting design – creating the right kind of ambiance and task lighting, and choosing the fixtures you want. 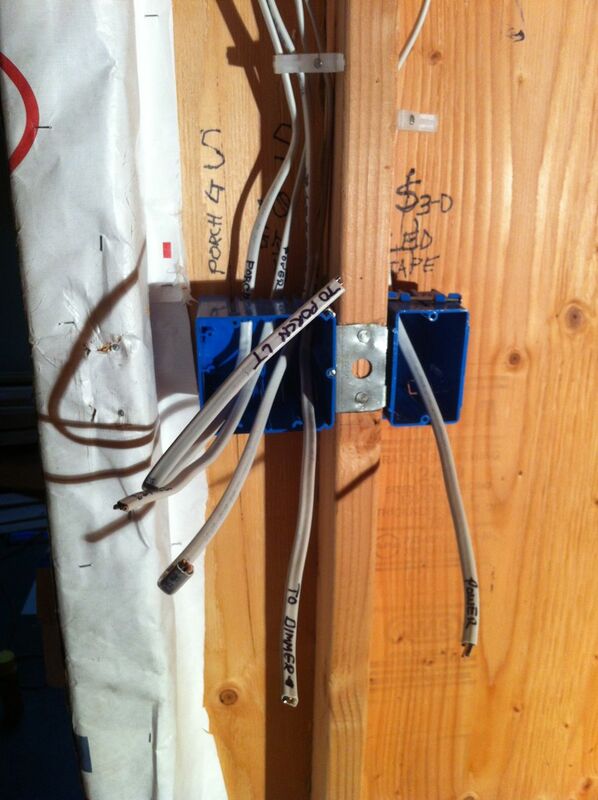 Functional design – making sure you have the right number and types of outlets, switches, etc., where you need them. Circuit planning – understanding electrical demand and use and plotting efficient ways to route your circuits. Code knowledge – to keep you safe. 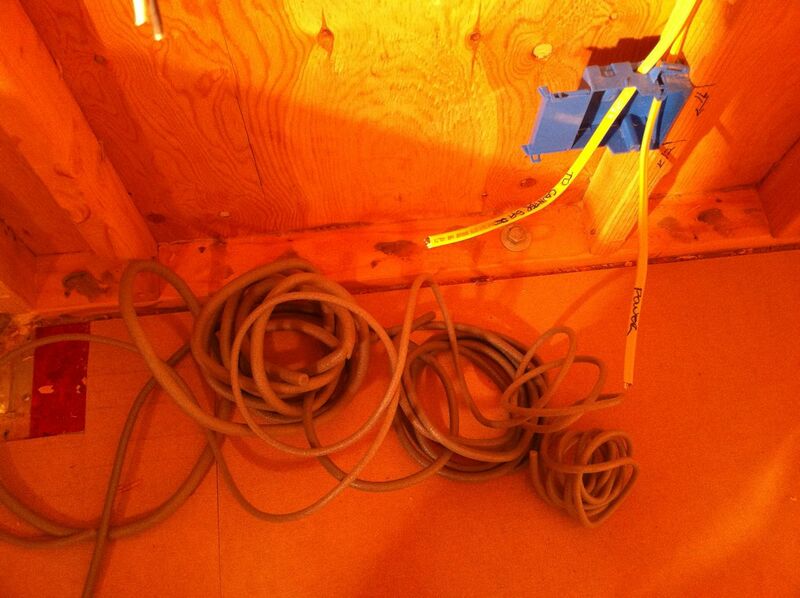 Materials knowledge – knowing types of cables, electrical boxes, etc., and when to use them. Device wiring – knowing which wires connect to what. Future options – knowing how to plan for any future solar installations, internet, A/V, etc., so they are easy to implement when the time comes. This was a lot to take on, but after I got over my initial feeling of being overwhelmed, I got into it. Lighting and ambiance design is very important to me and I spent a lot of time thinking through what I wanted and ordering fixtures so there wouldn’t be any surprises when it came time to install them. I spent endless hours crawling through the web and watching YouTube videos to understand how to do everything else. Checking the ambiance of a task light over my future sink. Lighting design can really affect how a space feels. Starting to diagram out my lighting plan and designing the circuits. I felt compelled to draw out how each device would be wired. I learned a lot but it was probably a little over the top! 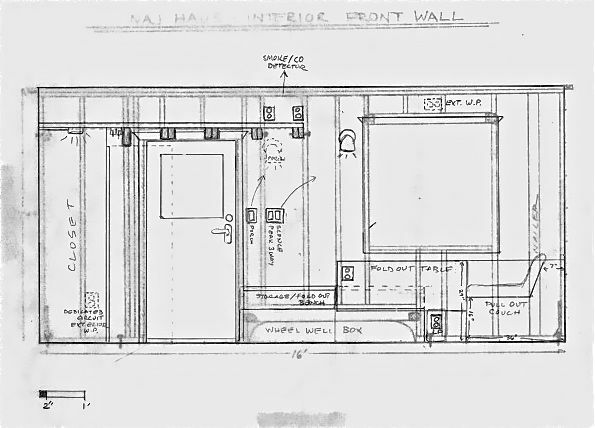 An early drawing of where to place electrical boxes. 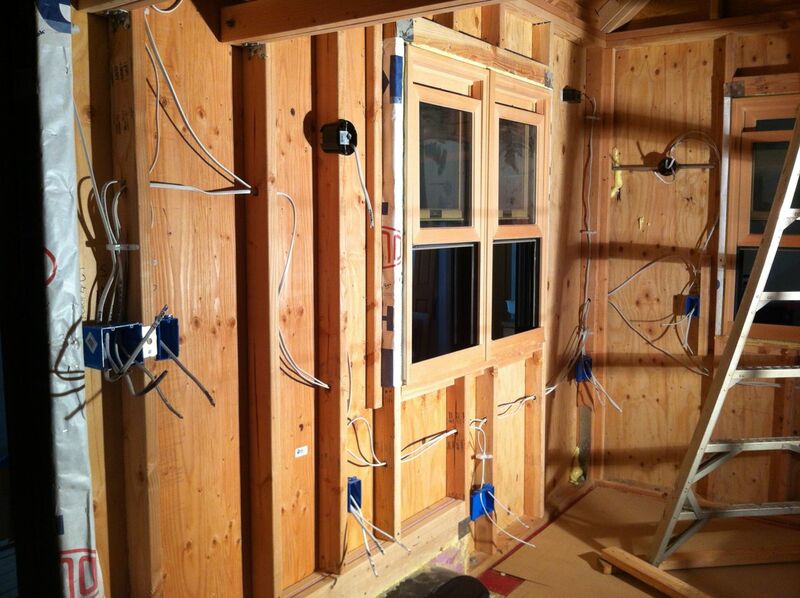 I had made scaled as-built drawings of my stud placements and then put tracing paper over them to plan out both my wiring and my cabinets. 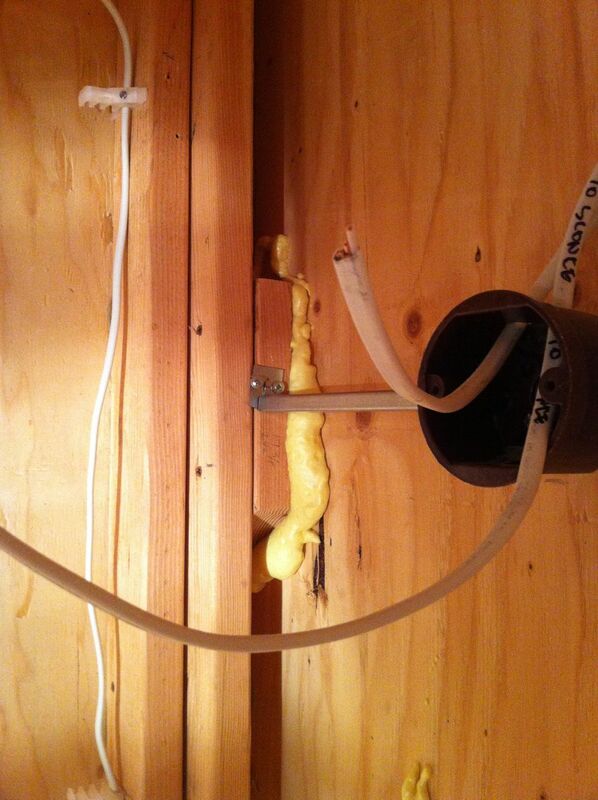 There are many kinds of electrical boxes (which house switches and outlet receptacles), and it’s important to understand when to use the different ones and to make sure they are shallow enough to get some insulation behind them to prevent condensation and drafts, but are still properly sized to house the wires and devices. Todd was great about explaining code to me and how to design circuits effectively, plus imparting many tricks of the trade. 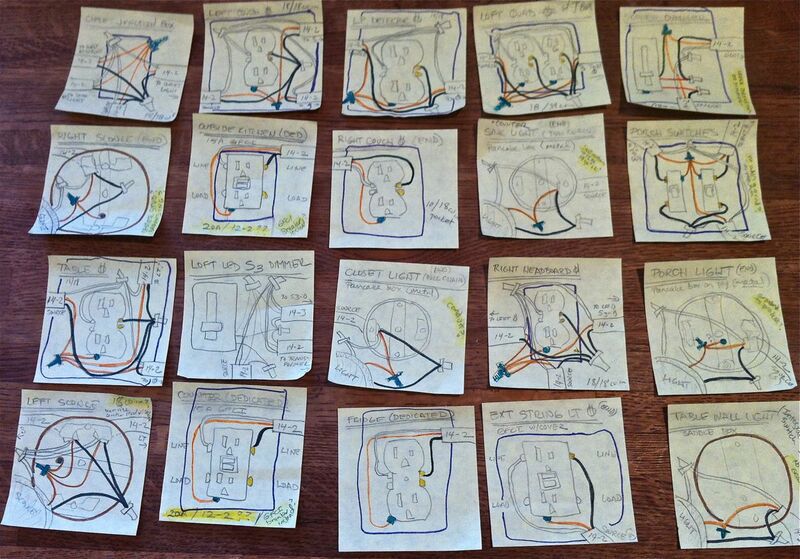 When he laughed at my diagramming out the wiring of each and every switch and receptacle in my house on Post-It notes, I realized that, while this was ultimately important to know, I was dragging my feet because I was scared to actually get started. You have to learn to recognize when you are being thorough and when you are paralyzed. If you’re coming up with more and more outlandish delaying tactics, maybe you just need to dive in and get started! I’ve found that breaking it down into small steps, and taking one at a time, helps immensely. I want you to become what is love. Possibility; capable of being or becoming; a latent excellence or ability that may or may not be developed. Electricity: the work done per unit charge in moving an infinitesimal point charge from a common reference point to the given point. Physiology: the change in electrical potential that occurs between the inside and outside of a nerve or muscle fiber when it is stimulated, serving to transmit nerve signals. 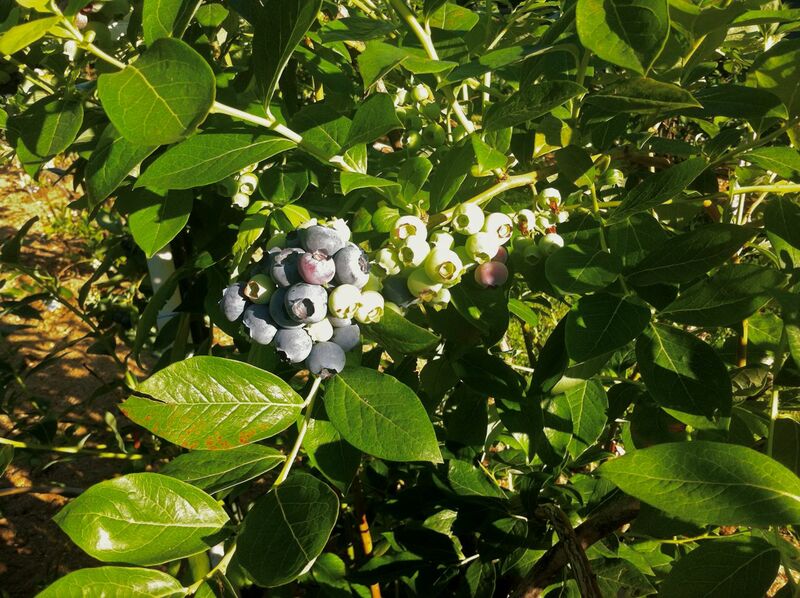 This was the first spring that I have spent living on my parents’ blueberry farm, so it was also the first time I was able to watch the continuous process of the dormant bushes blossoming and producing blueberries. 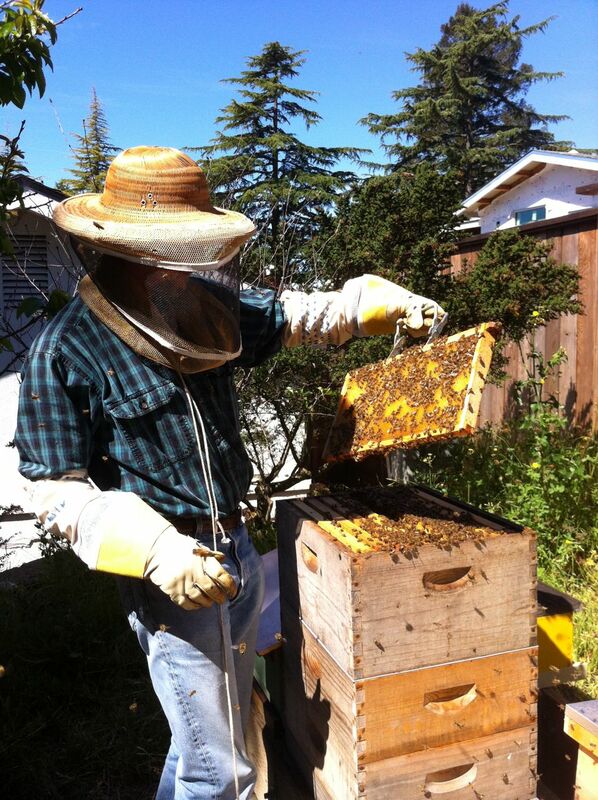 I also had the chance to visit some friends who keep bees. 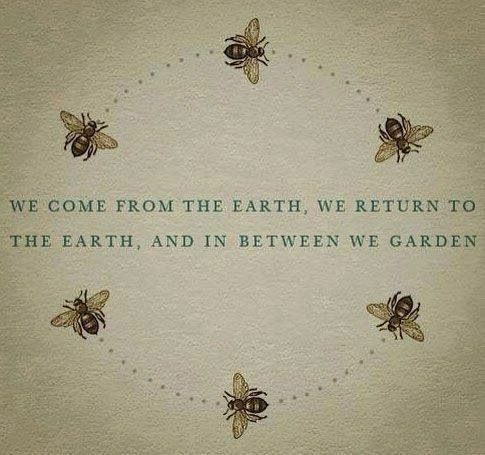 Hearing about the complex community and life cycle of bees helped me appreciate even more the intricate interdependencies tying us all together, and how tiny actions can accumulate to bring about dramatic changes. 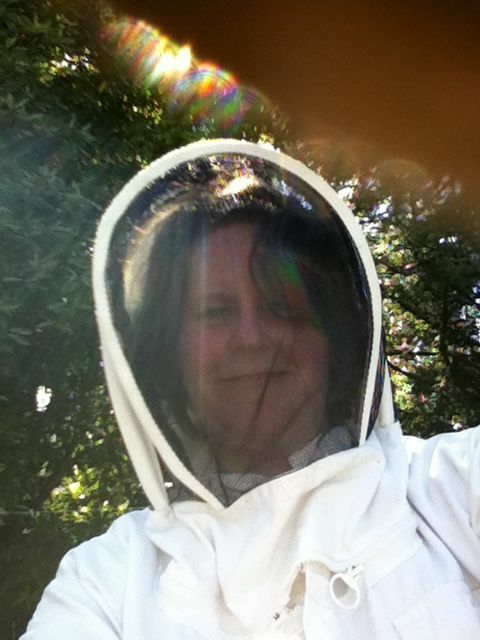 I donned the full getup for my introduction to beekeeping. 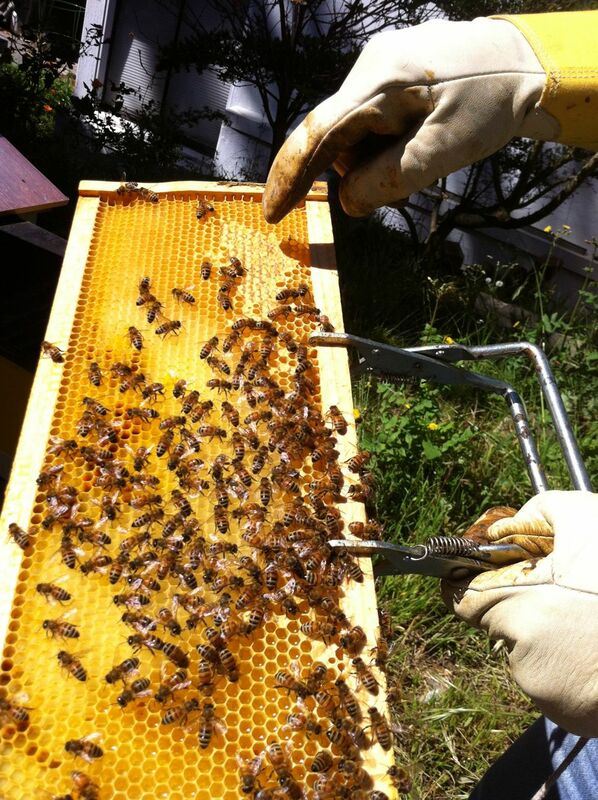 Bees going into a hive. 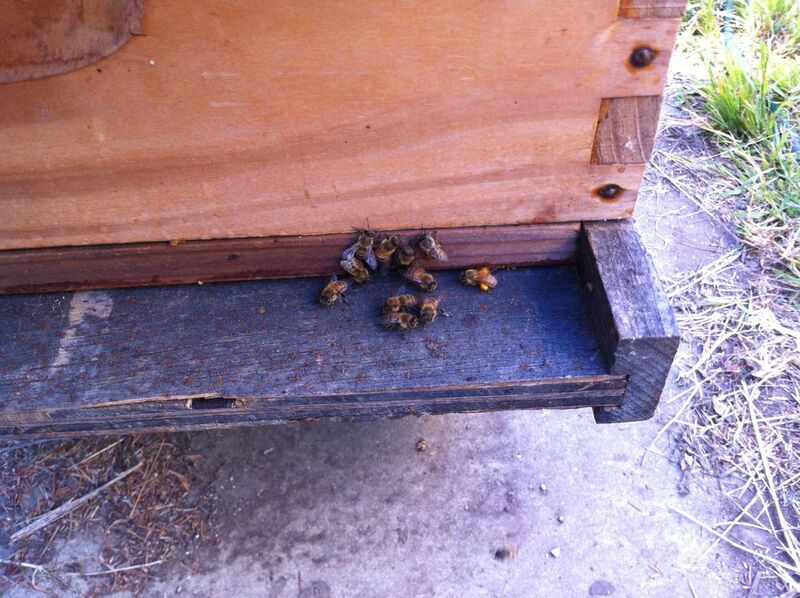 Note there’s one with pollen saddlebags. These are different colors depending on the type of pollen they are collecting. 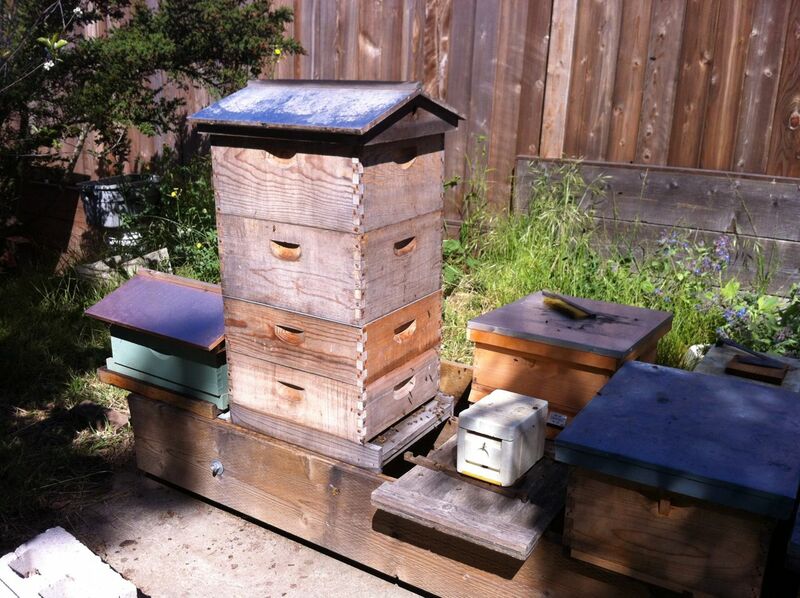 This one is just beginning to fill with honey. This one has more honey. There’s actually a lot going on here. Some workers are building a new cell for the queen. It is on the left, perpendicular to rest of the comb cells. It will be filled with royal jelly for her. 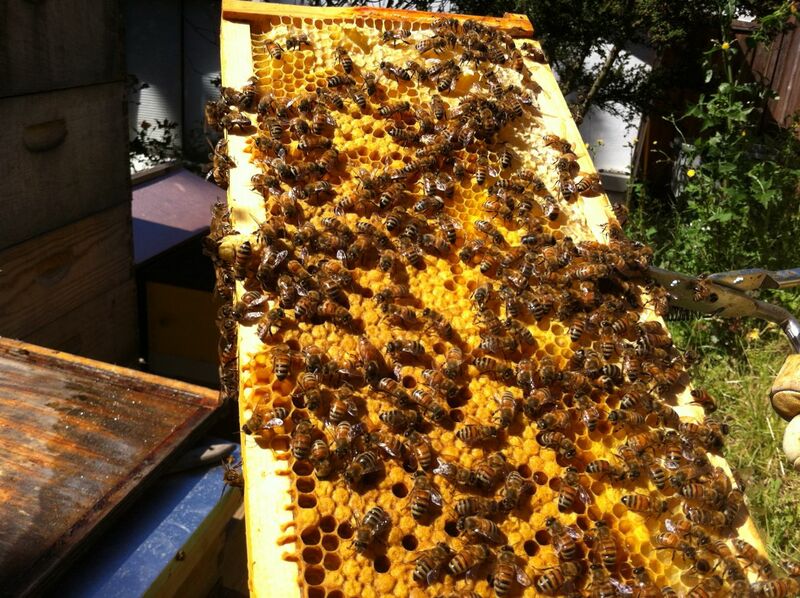 In the foreground are cells filled with something called “bee bread”. 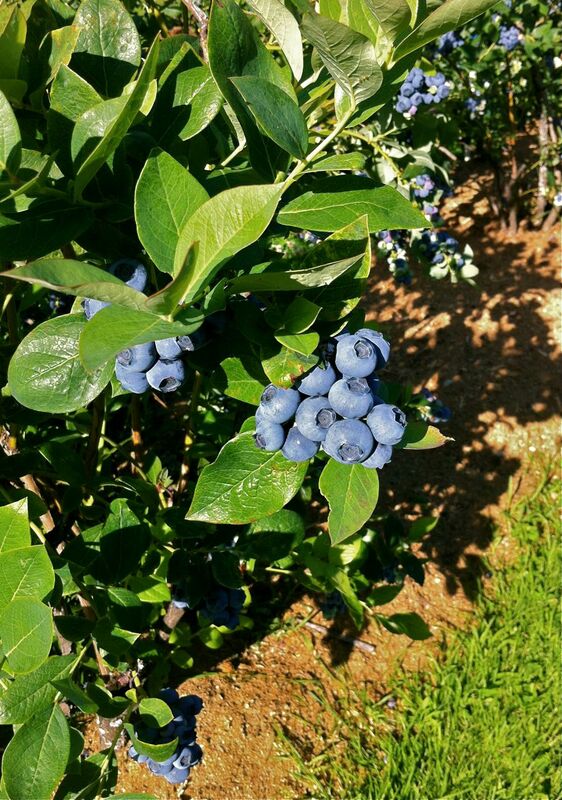 As the blueberry bushes began to blossom, there was a defined period in which the bees arrived and busily flew from one flower to the next. Each bush had from 5-10 bees at any one time, which means there was likely between 1500-3000 bees just on our property alone! 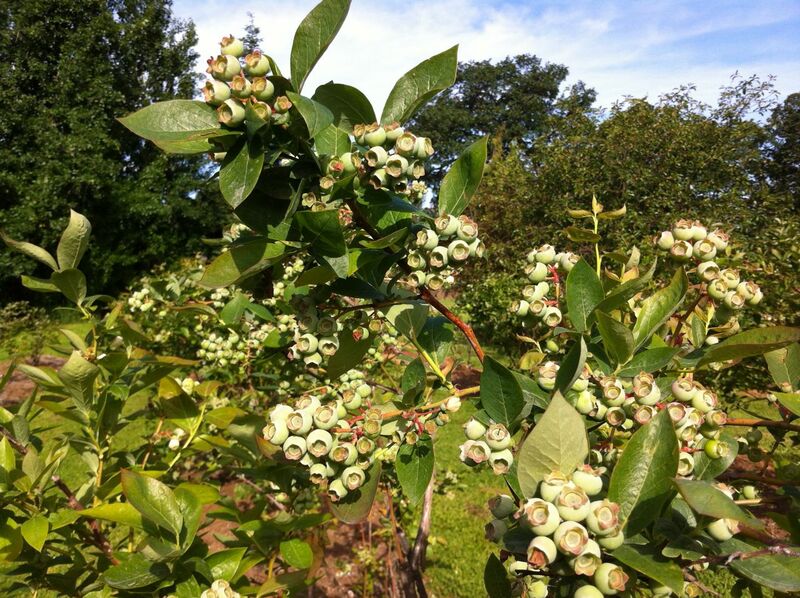 Not long after all this pollinating occurred, the blooms fell off and their bases swelled to form the berries. A rather fuzzy photo of early blossoms just beginning to bloom. Full on blossoms, shaped like tiny bells and ripe for pollinating. Toward the end of the bloom, the blossoms fall off and their bases swell to form the berries. 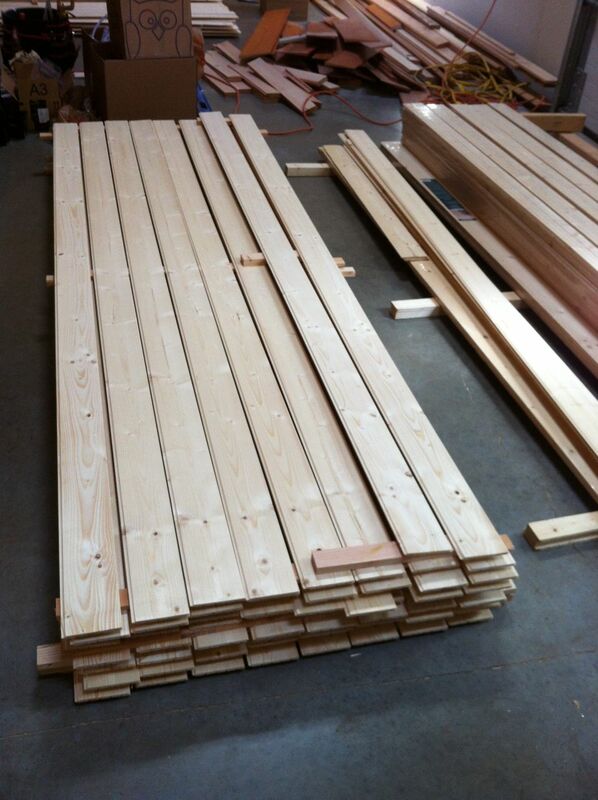 Watching all this activity, and watching myself build my house, I thought a lot about the idea of potential. Potential is this mysterious force within everything, to become what it can be. If we don’t interfere, better yet, provide encouragement, water, light, fertile soil, or whatever nourishment is needed, that latent potential will become real – sometimes quickly and dramatically, more often slowly, through tiny changes. This is the nature of nature: dynamic, changing, growing. Hidden within us, it is the possibility of becoming, of blossoming, of nerve cells and muscles twitching, of carrying energy. It is our potency. 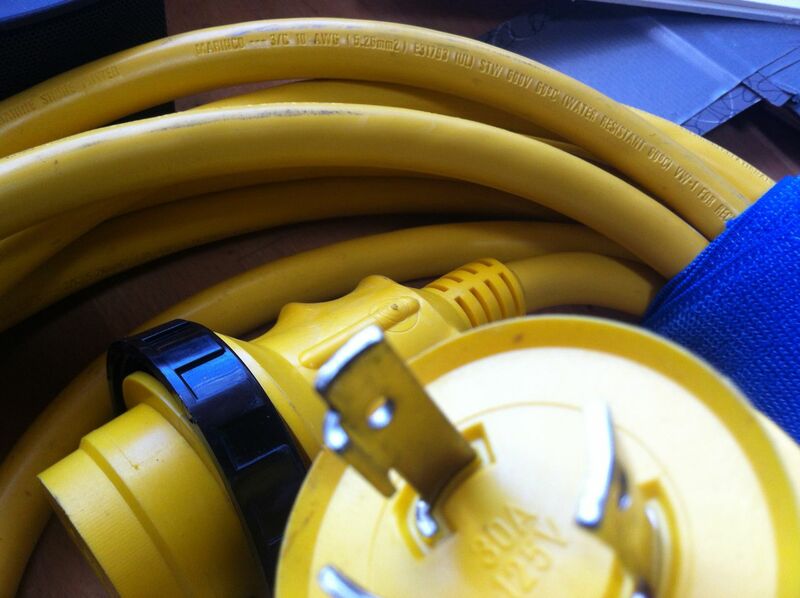 My 30 amp power cord waiting for my tiny house. By taking one small step at a time, I wired my house. It really wasn’t particularly hard once all the decisions had been made. 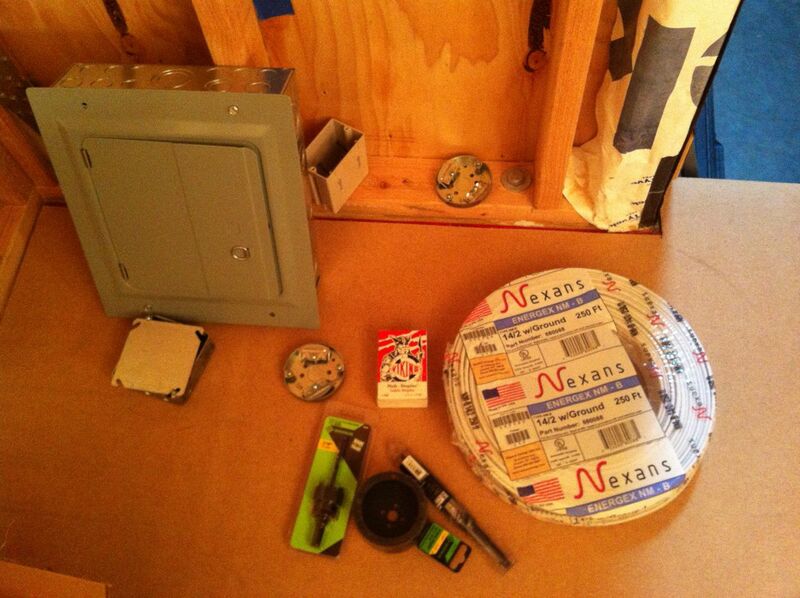 Some of the materials for the wiring the house: panel box, pancake box for a light, staples, 14-2G cable, 7/8″ drill bit and a hole saw bit for the pancake box. 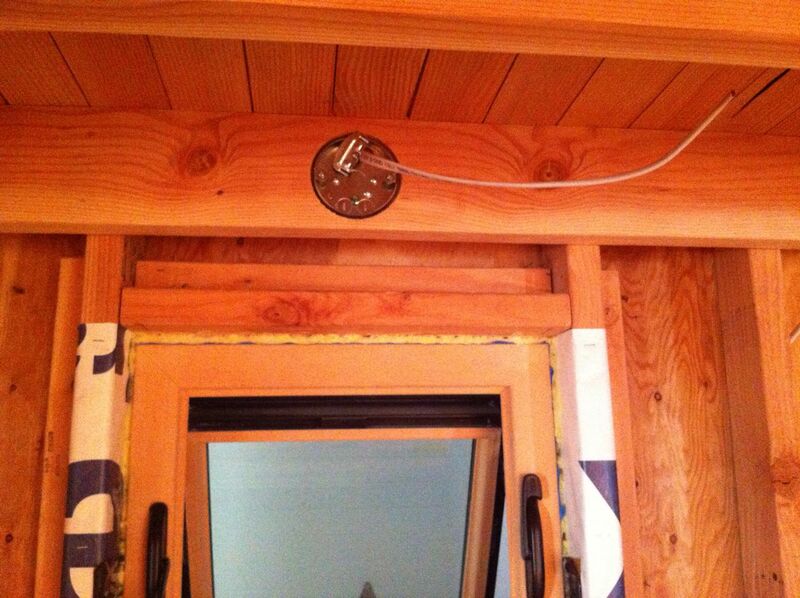 Installing the hanging box for my sconce. I will be putting in a couple task lights in the kitchen. 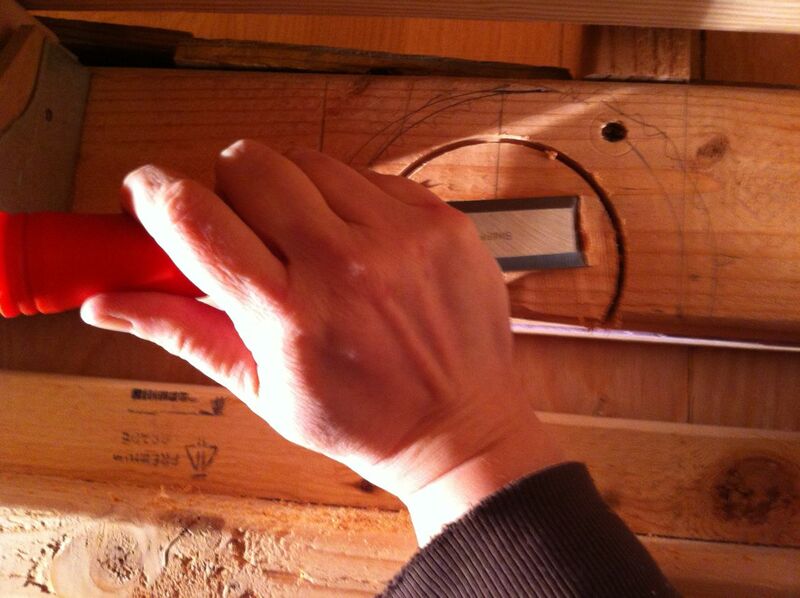 Here I am using the hole saw to make a 1/2″ deep cut for the pancake box. 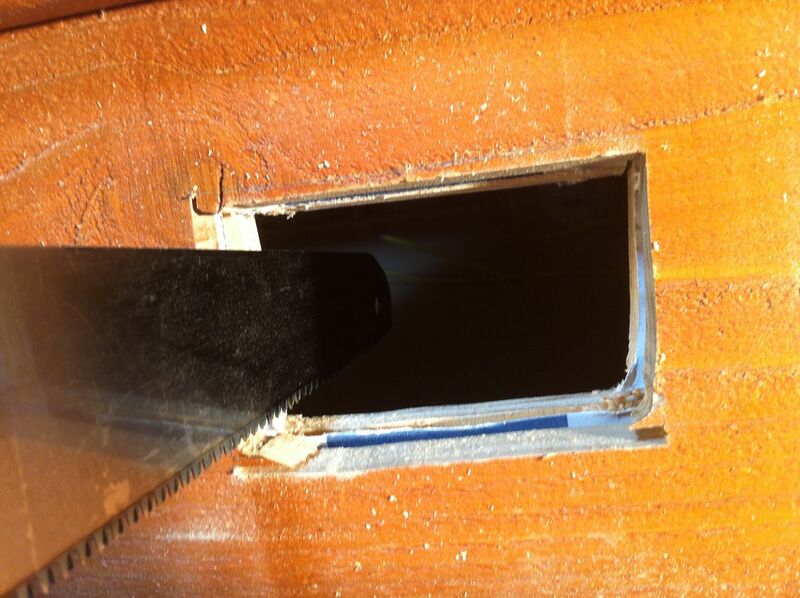 I then had to chisel out the interior to 1/2″ and drill a hole for the cable to come from behind. The big bit really tore through the studs. 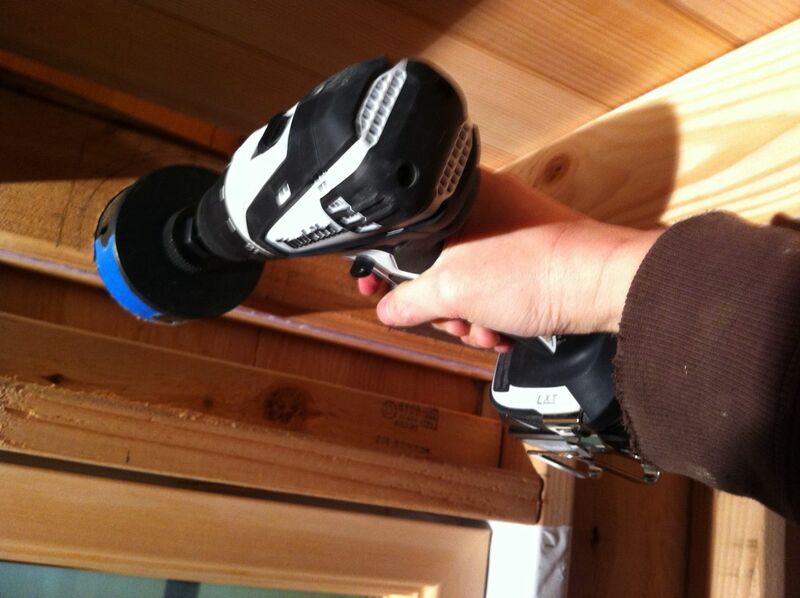 You have to learn which way the drill wants to flip so you don’t get bruised. 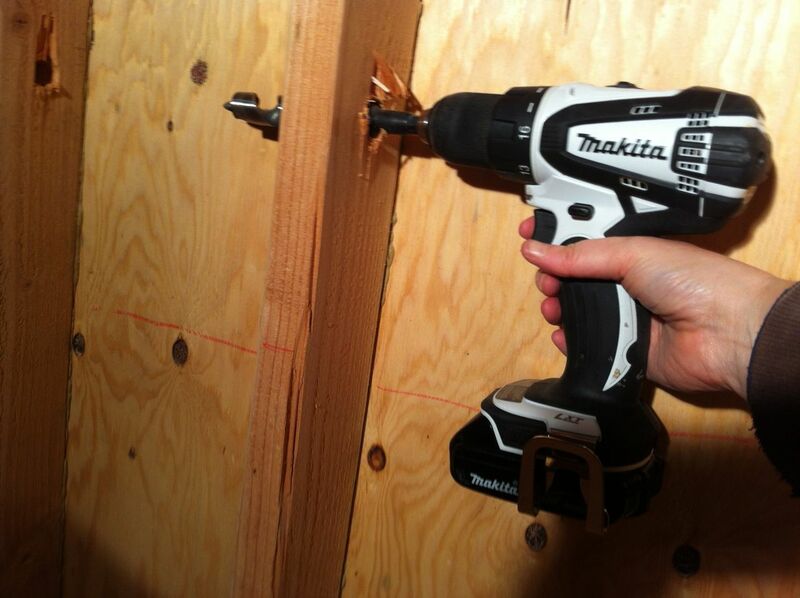 Ideally you can brace it on a part of the house as you drill. 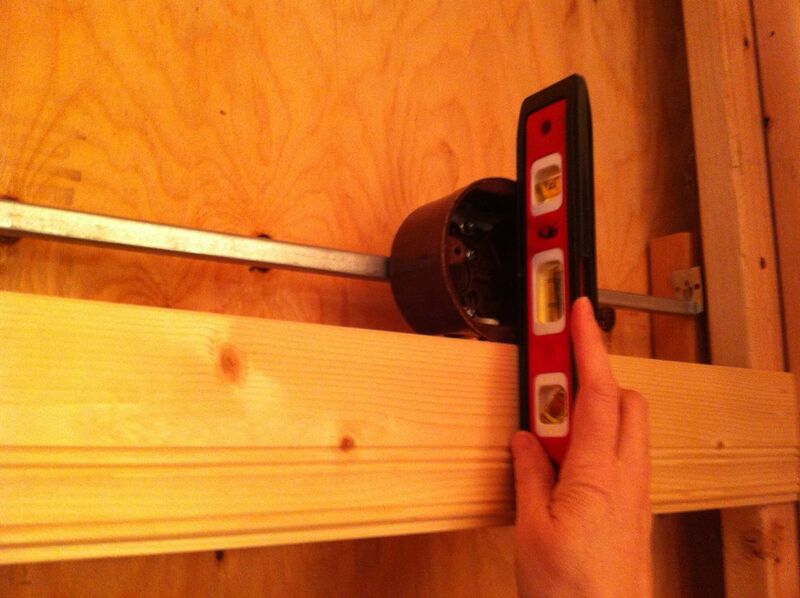 Here I’m installing a box for an exterior outlet. 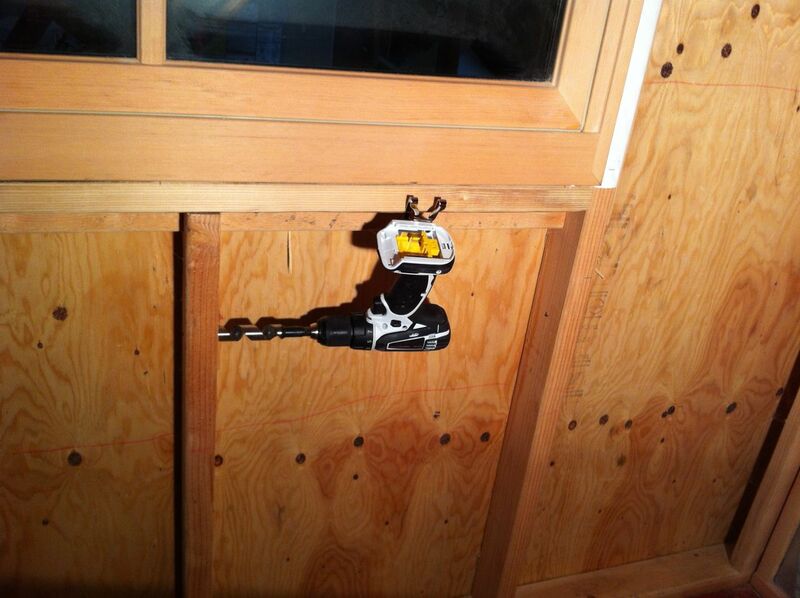 This required cutting through my siding and sheathing with first a jig saw then cleaning it up with a hand saw. Cutting through the side of your house feels a bit like giving yourself an appendectomy. Boxes for switches by the front door. I still need to strip the wires to install the devices. 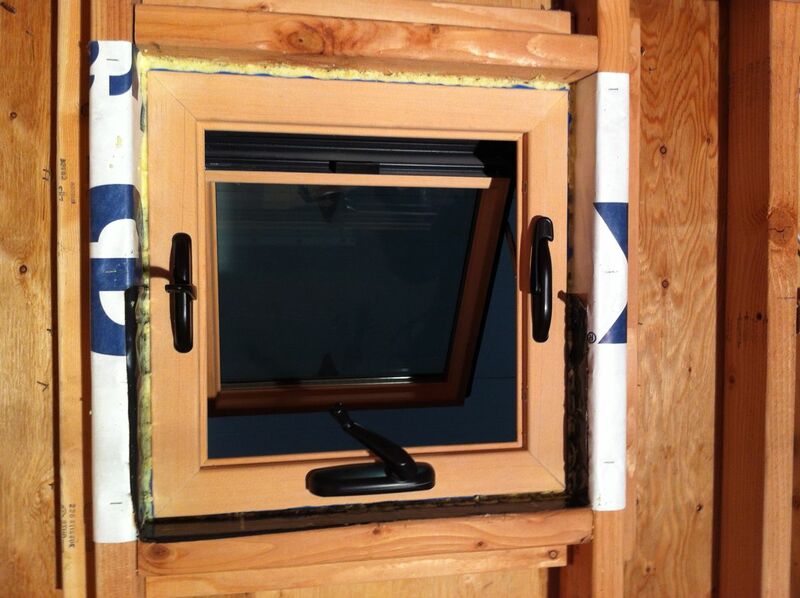 Panel box installed with rigid foam behind to act as a thermal break and prevent condensation from forming in the box. I’m in the process now of having an electrician wire the actual circuit breakers and main power line coming in. 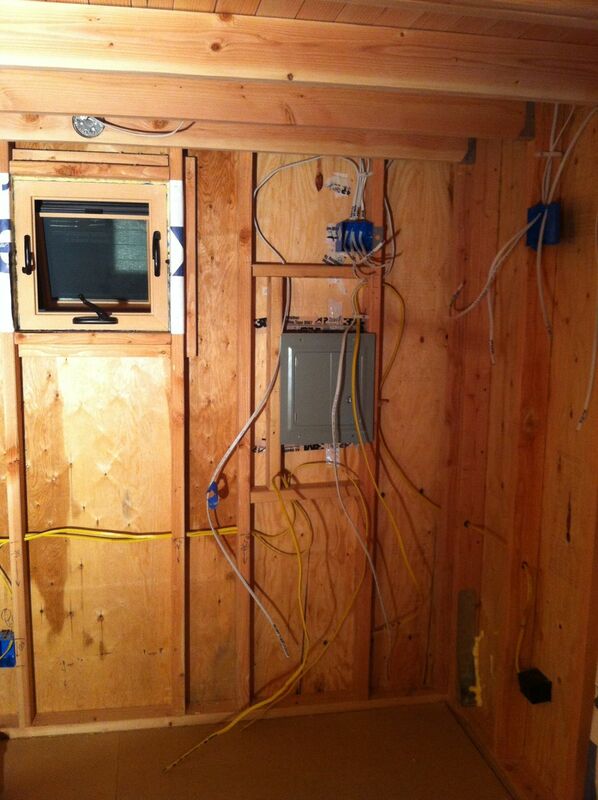 Another wall wired. There’s one tricky situation that still needs to be done but otherwise I am close to starting to put up the walls! 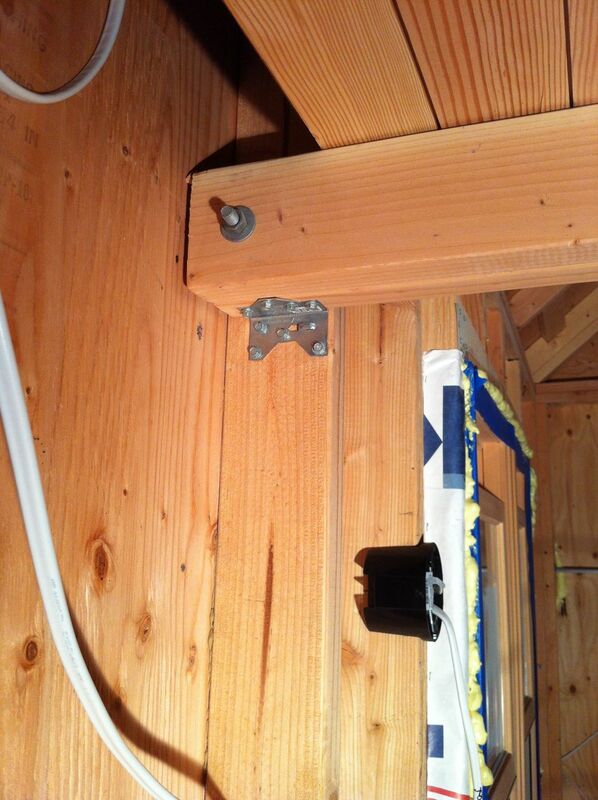 I installed some of my loft joists with hangers and some with bolts. Because I doubled up the 2x4s, I got a little worried the bolts would bend so I added some Simpson braces. Those little puppies can support something like 500 lbs each! Though my siding has been up for awhile having used a nail gun to hold it temporarily, I finally got around to screwing every board down. 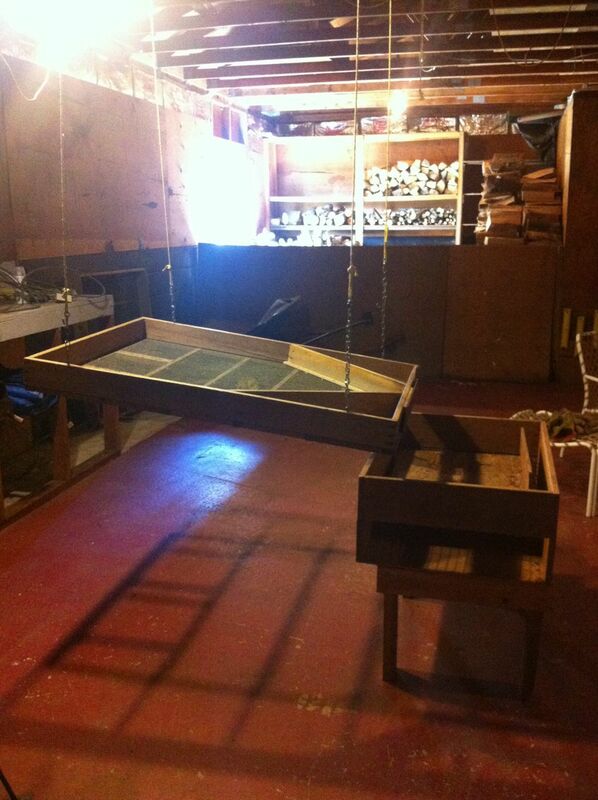 This is a little jig I made to place the holes evenly. 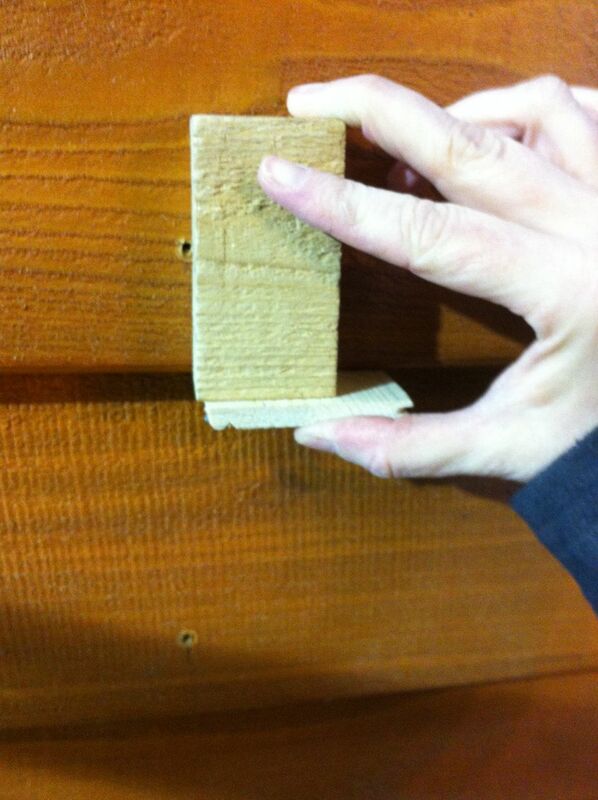 Knotty pine paneling unfortunately comes wrapped in plastic, with only six boards to a pack. 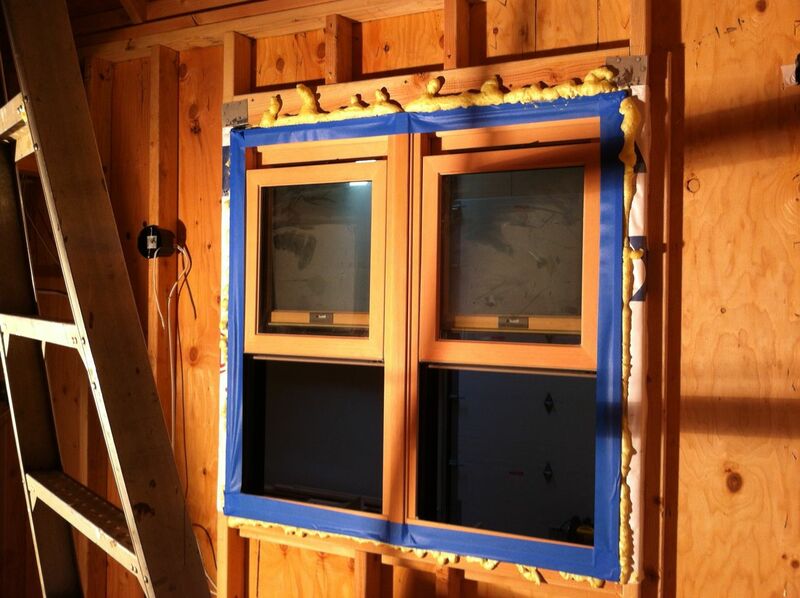 You need to unwrap them and place them on “stickers”, short pieces of wood, so that all edges are exposed to the air and can acclimate to the humidity and temperature and not warp when you put them up. 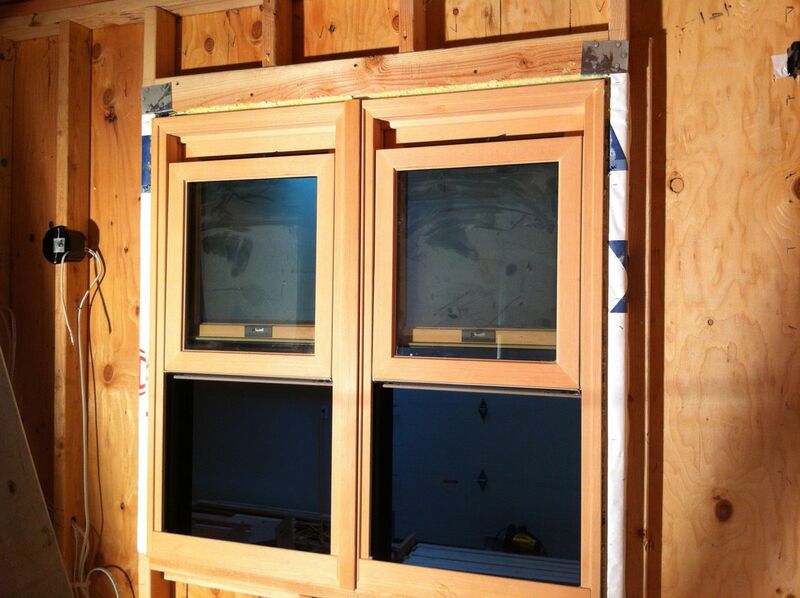 You need to do this at least 4 days, ideally a couple weeks, before you install them. 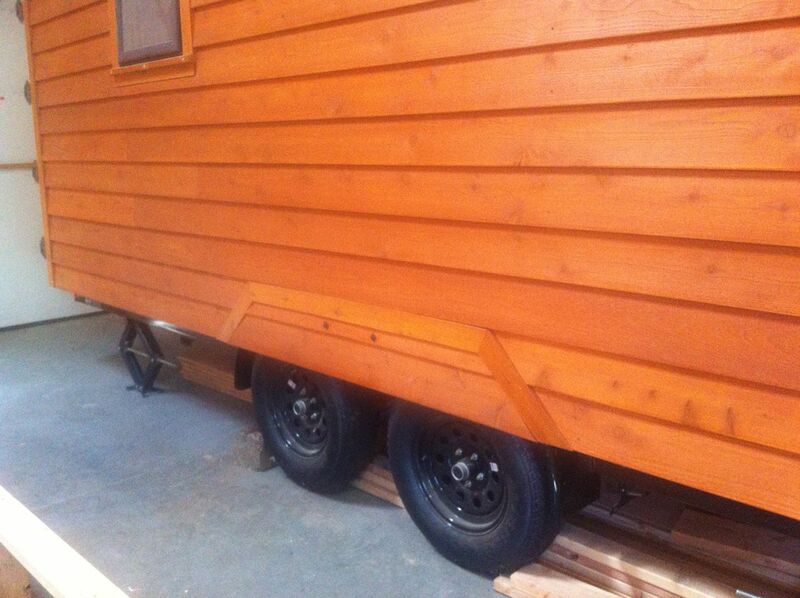 I realized that when I put my porch up along the side/front of the house, the tops of the wheels would show. So since I had some time to kill, I made inserts (essentially replicas of the sheathing and siding) that I installed with bolts into the metal of the wheel well. They can be taken down when the house will be moved. They look a bit like Grumpy Cat. A study in blue. 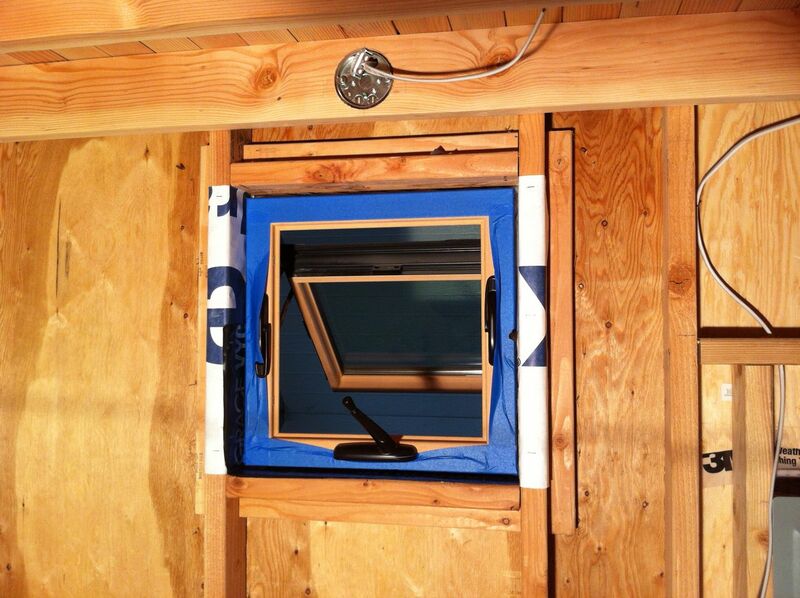 Prepping the windows to seal the gaps. 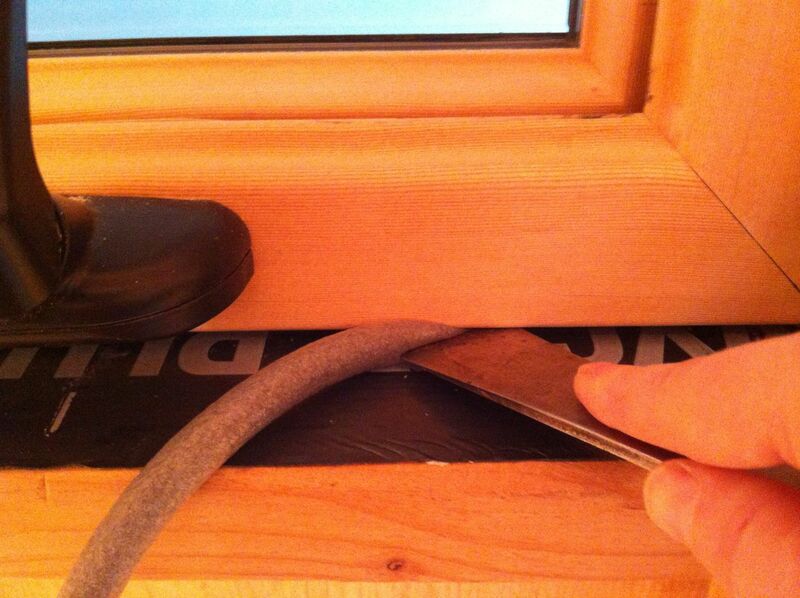 I decided on a belt-and-suspenders approach to sealing the gaps around my windows. First I put in backer rod, which is foam tubing that comes in different widths, then I used Great Stuff, a foam spray sealant. 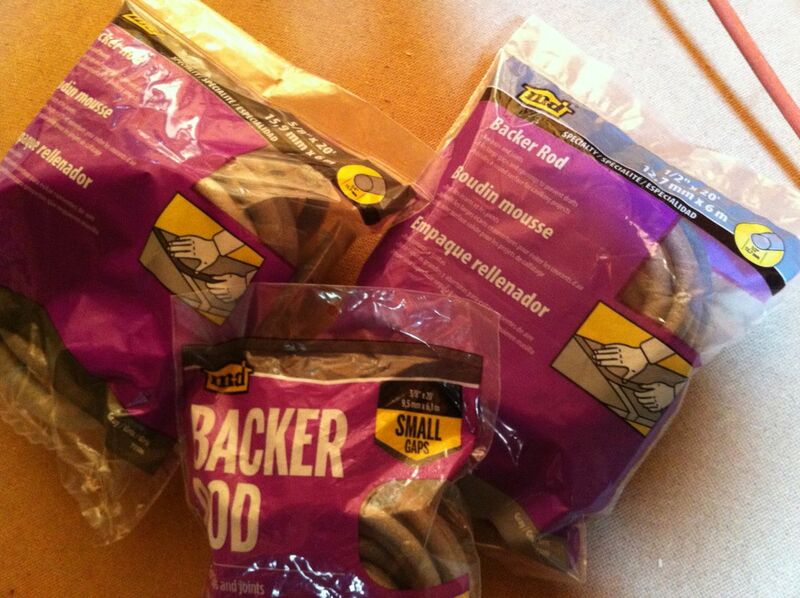 Different sizes of backer rod. I discovered that a small flat pry bar can help roll the rod into the gap. 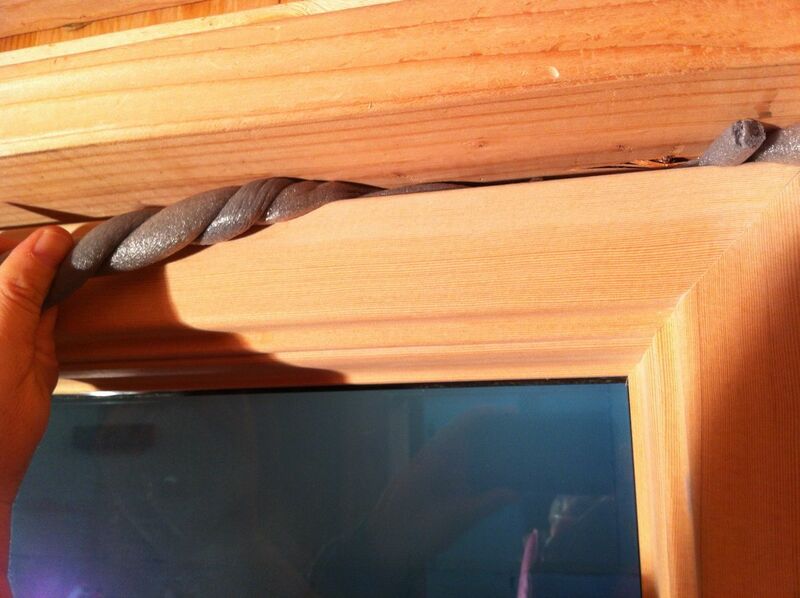 For larger gaps, you can twist the rod. I found that it was good to leave an end sticking out so that you know you’re not sliding the end down the gap horizontally as you insert it. Again I used a pry bar to push the rod into place. 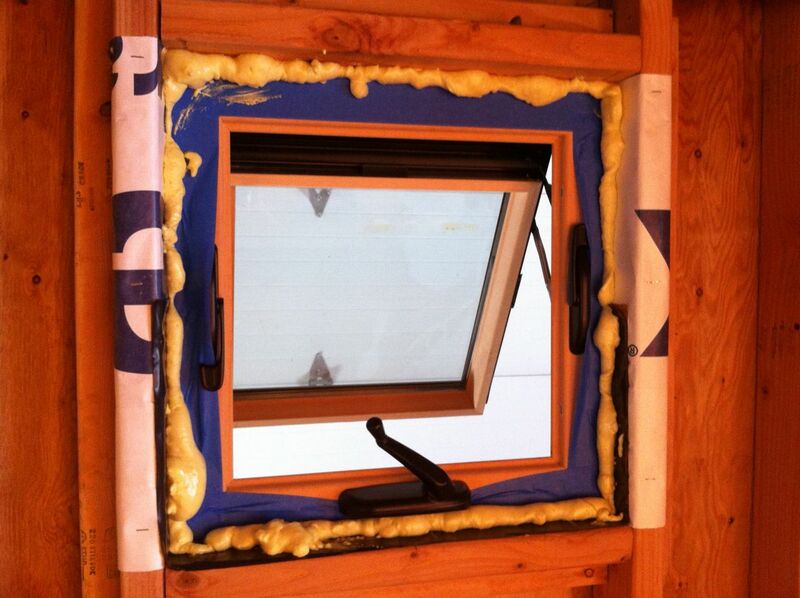 I used painter’s tape to protect the windows from the foam. Even knowing that you need a light touch, it’s really hard not to overfill the gaps. Foam bunny hiding. 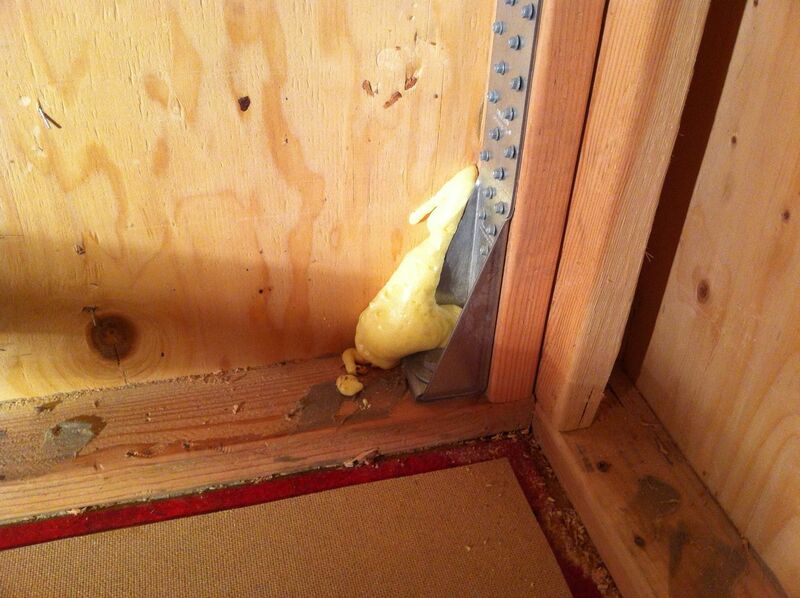 If you have extra foam, you can use it to fill hard-to-reach places that your insulation may not get into. Another place where I used extra foam. After the foam has cured (8 hrs) you can cut the excess away with a serrated knife. I happened to have a grapefruit knife which was perfect once you flattened the end since it was thin, flat and flexible. 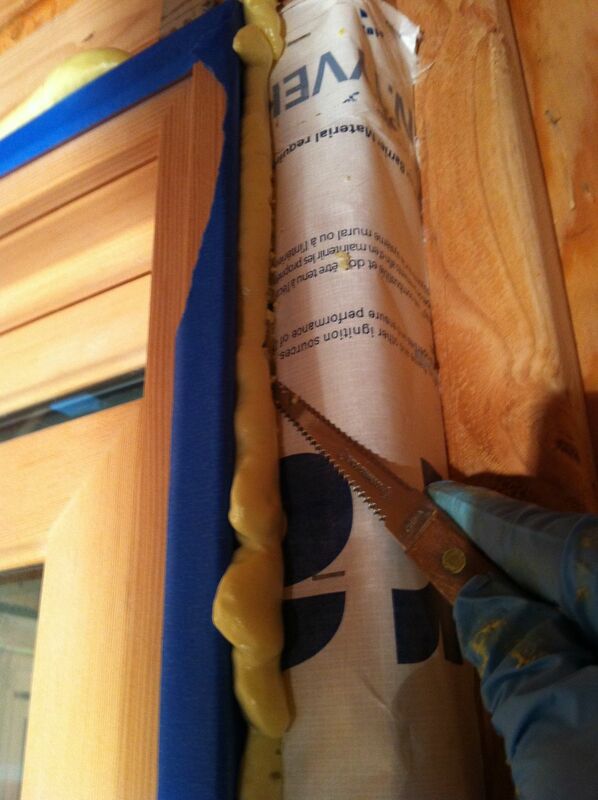 Peeling the cut foam away. After the tape and excess foam have been removed. 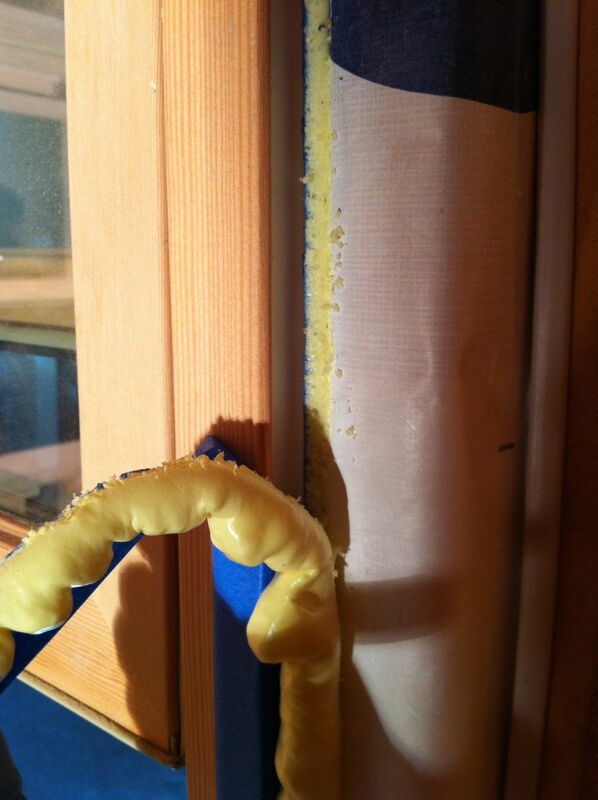 Another over-foamed window. Love the look at the top! Thankfully it cleaned up well. Gotta love the tape! 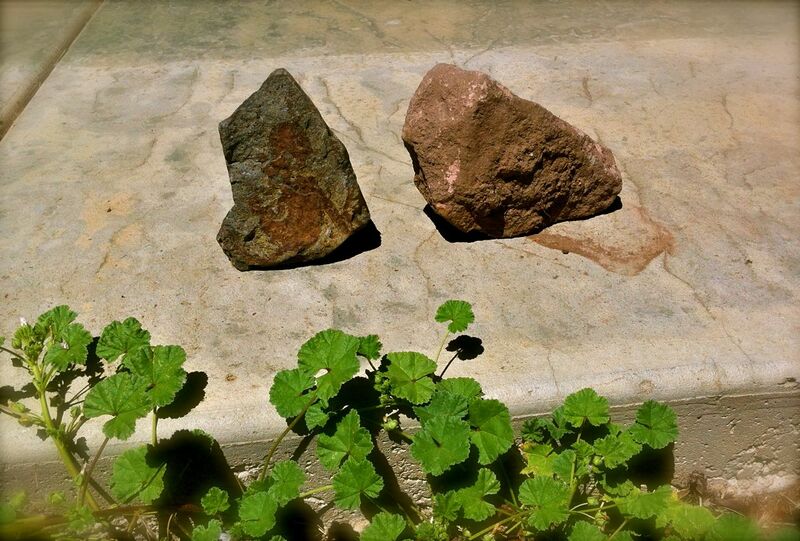 Just after I finished sealing the windows, I had my unfortunate encounter with the rocks. Once I was vertical again, I decided to start fluffing wool for my insulation. 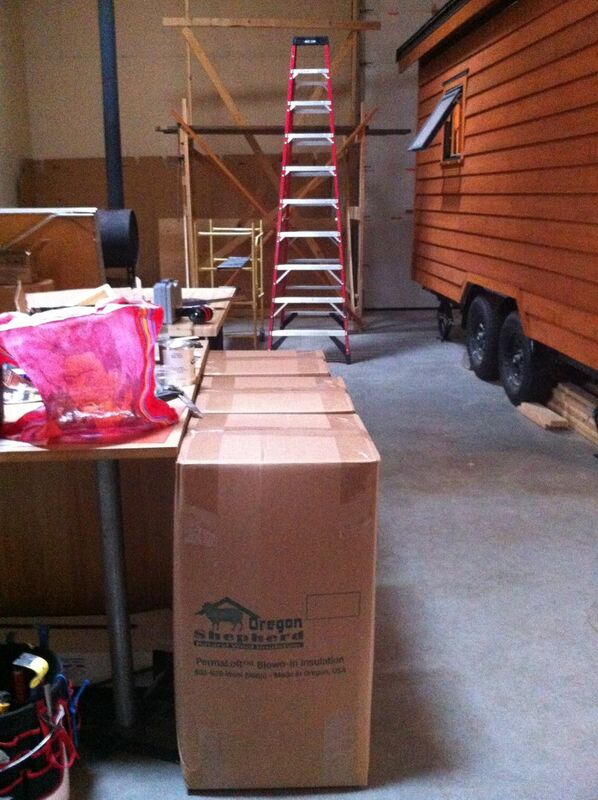 It comes densely packed in boxes. 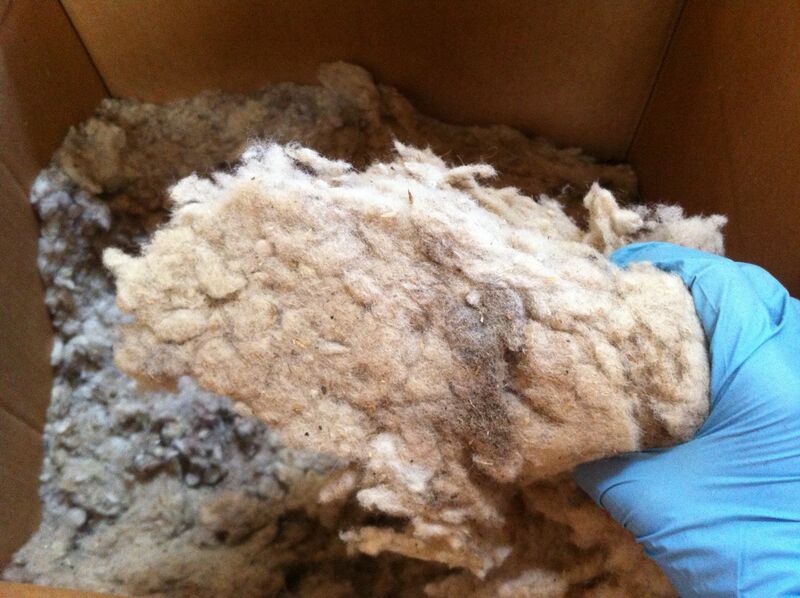 Wool works by trapping warm air between the fibers so for it to be effective it needs to be “fluffed”. While there are machines that can do this, I haven’t heard good reports from those that have tried them. I chose wool because it was natural and nontoxic, and something about having a house made of wood and wool thrills me, but I knew that it would be labor intensive. I’m finding it takes about 10-12 hours to fluff one box of wool thoroughly, and I have six boxes to do. 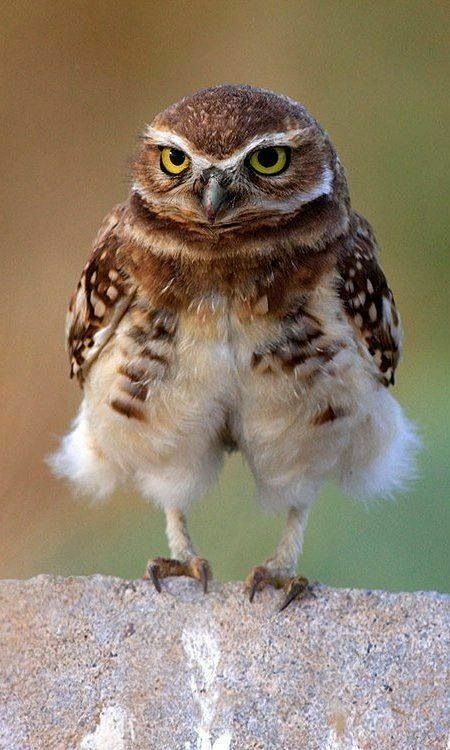 Many tiny housers have wool fluffing parties to get through it faster. I may seek help at some point, but for right now, I’m finding it very meditative doing it on my own. It’s a test of perseverance. Three of my six boxes of wool (plus I used 1.5 boxes in the floor). Hoping this will be enough (it’s what Oregon Shepherd calculated) but won’t know how far a box goes until I start installing it. The fluffing station. 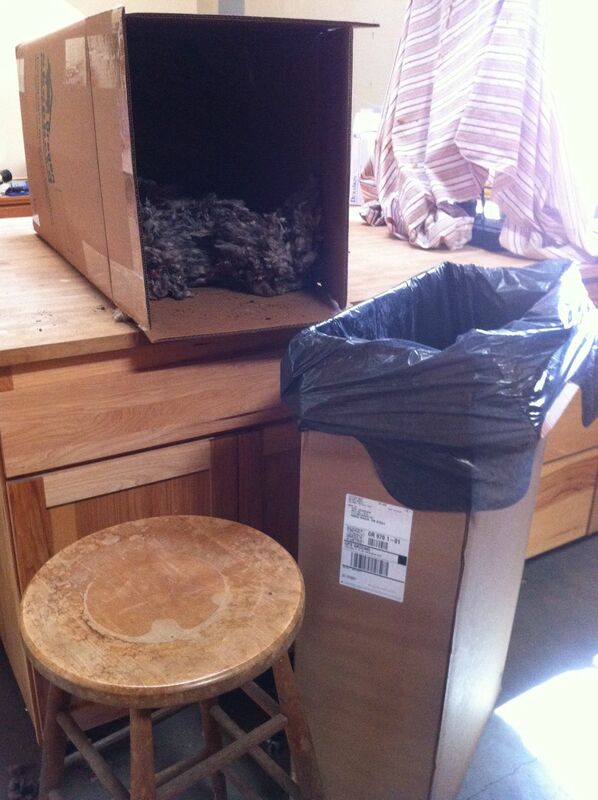 This box was a good height to rest my arms on so I started using it to hold plastic trash bags that I filled with wool. This gives you an idea how densely packed the wool comes. It’s almost like felt. This is after it has been fluffed. 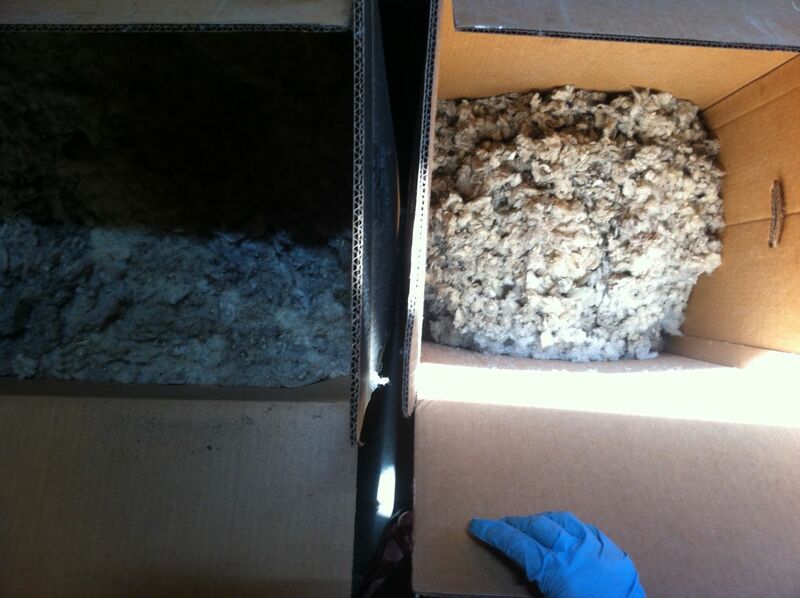 It’s hard to see, but about 5″ of compressed wool from the box on the left resulted in 15″ of fluffed wool on the right. While I’m periodically daunted by how slowly it goes, I’m finding I enjoy the work. I start off with my head buzzing with activity but, as I get into it, the motions get repetitive and rhythmic and my brain slows down and goes into a kind of trance. 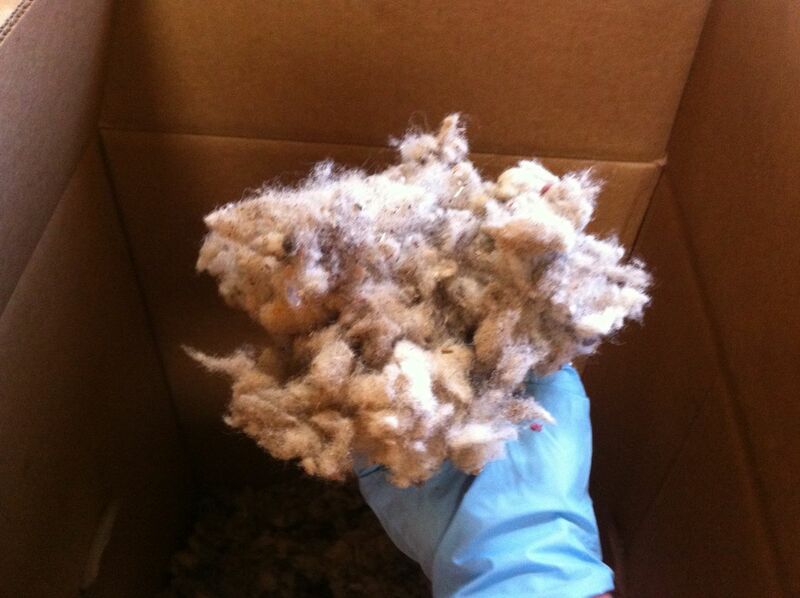 It’s satisfying to watch the fluffed wool pile up and the compressed wool dwindle. My mother knits, spins, and weaves and I feel akin to those tactile textile traditions. It makes me a little sad that most of us have grown so impatient that we’ve lost the peacefulness of the slow rhythm of working with natural materials and our hands. I know this is a luxury of time that not everyone has, but, for the most part, we seem determined to be a culture of not only “bigger is better”, but “faster is better”. Sometimes in this race to succeed, to get there the quickest way possible, we lose sight of the simple things that can make us happy. In The Small, Happy Life, an op-ed piece in the New York Times, David Brooks tells how he asked readers to describe how they view their purpose in life. To his surprise, many of them found their purpose by focusing on the small things. 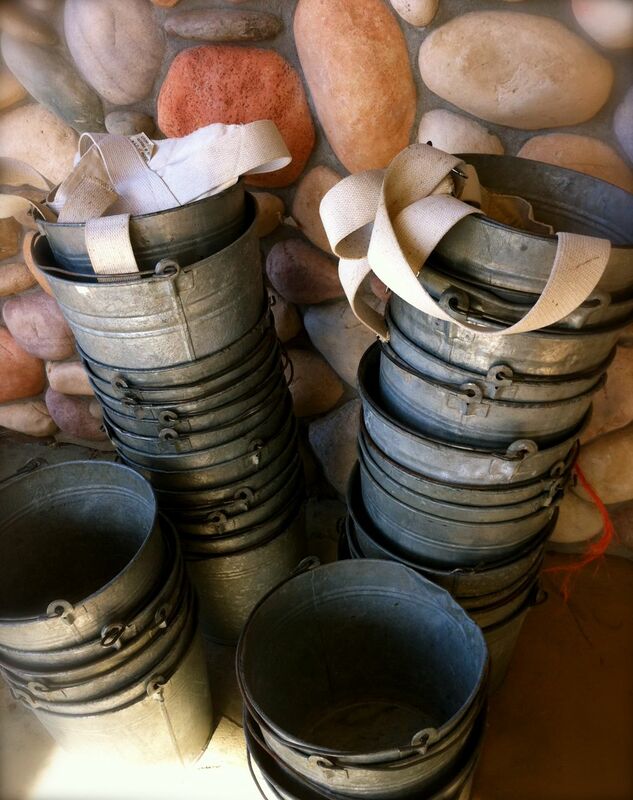 One man kept an old, dinged tin pot to remind himself that not everyone has to shine, which freed him to pursue his interests regardless of how they were valued by society. An 85-year old man discussed that while at his age, the meaning of life is becoming very urgent, his purpose is now concentrated on tending his garden. I believe that one of the keys to happiness is having a sense of satisfaction. One of the definitions of satisfy is to “give full contentment to”. Satisfaction comes from meeting your desires and needs. It comes from helping others. It comes from making a difference or creating something. It comes from nourishing ourselves and others. I am as new to gardening as I am to house building, and I don’t think it is a coincidence that I’m drawn to both at this time in my life. While I hope to have many years ahead of me, turning 50 does make you think about life and death and growth. It’s fascinating to me to observe the potential – the drive to become – inherent in every seed and plant. There is something similar and equally ephemeral in inanimate objects as well: the wind and water shaping the rock, the piece of wood holding up a rafter, the wire waiting to carry the current, the empty bucket waiting to be filled. So, too, our bodies want to heal. 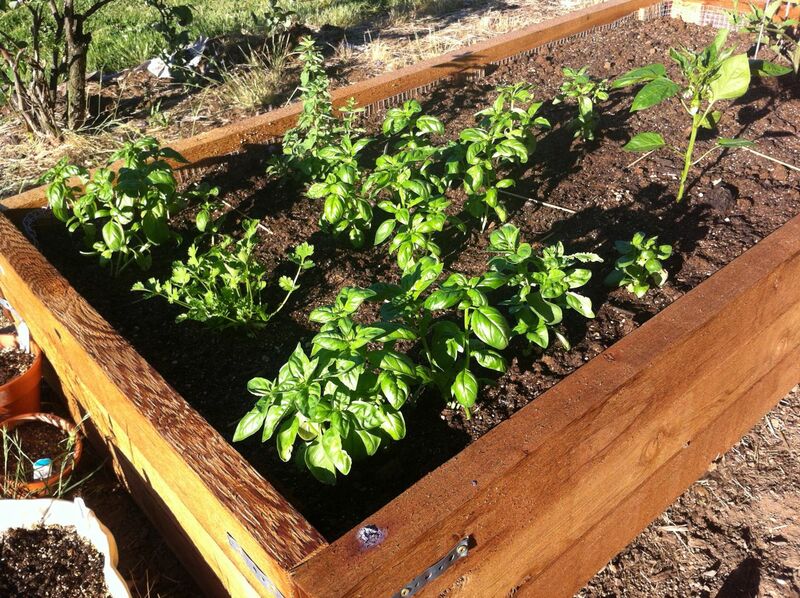 Our raised beds are flourishing. The simple sorting system poised and ready. At last, ready to eat! Scars are healed and will fade even more with time. Much better! There seems to be a recurring theme here of change happening incrementally. It is echoed in the electrical and physiological definitions of potential, in how the electrons move down the circuit to turn on a light, or the tiny electrical impulses that causes the muscle to twitch and lift a hammer, one of the many small steps that eventually, inevitably, builds an entire house. So if you’re feeling overwhelmed or impatient, perhaps you should pause and explore those “tiny, seemingly inconsequential circumstances”. Be curious, as Dee Williams likes to say. Be kind to others and to yourself. Try not to give yourself unreasonable deadlines; everything has an innate, proper time to unfurl naturally. Try to accomplish something, make some progress, every day – and do it well. Be patient. Persevere. Nourish your potent potential. And be sure to appreciate what you’ve accomplished. So to wrap up, I continue to struggle with my impatience (and I still can’t wait to get my walls up! ), but I am learning to slow down, tapping into my potential and the potential of all beings and things, finding silver linings in setbacks, taking time to be still in order to heal and revive the creative juices and passions, staying in the moment, appreciating the small things, the tiny movements, and the temporally transient because, really, what else can you do? Peace in mind for us, also giving. there is the warm gentle. 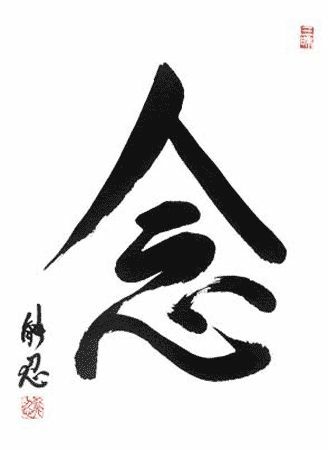 Image 3: Kanji calligraphy by Nonin Chowaney from the Appamada blog post by Peg Syverson. 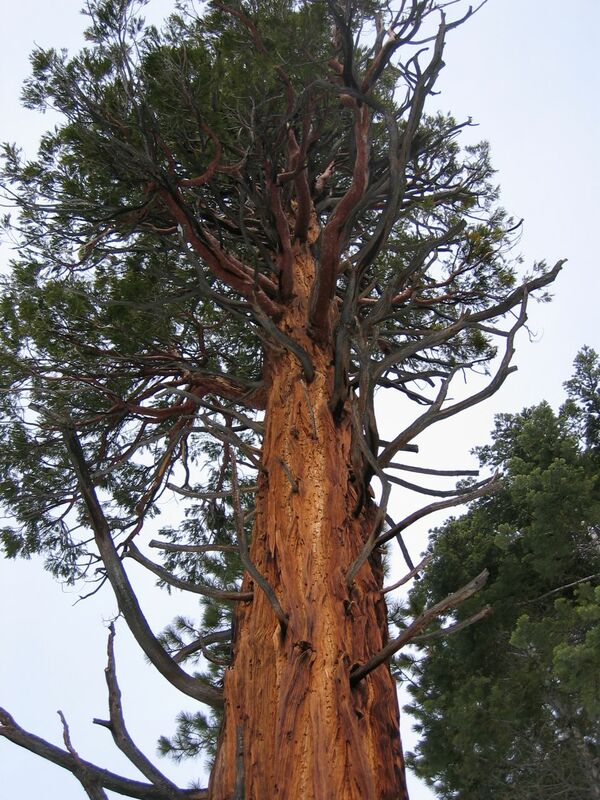 Image 5: Ancient Sequoia tree in the Sierra Mountains, CA. Incidentally, this same tree provided the background texture to my blog site. 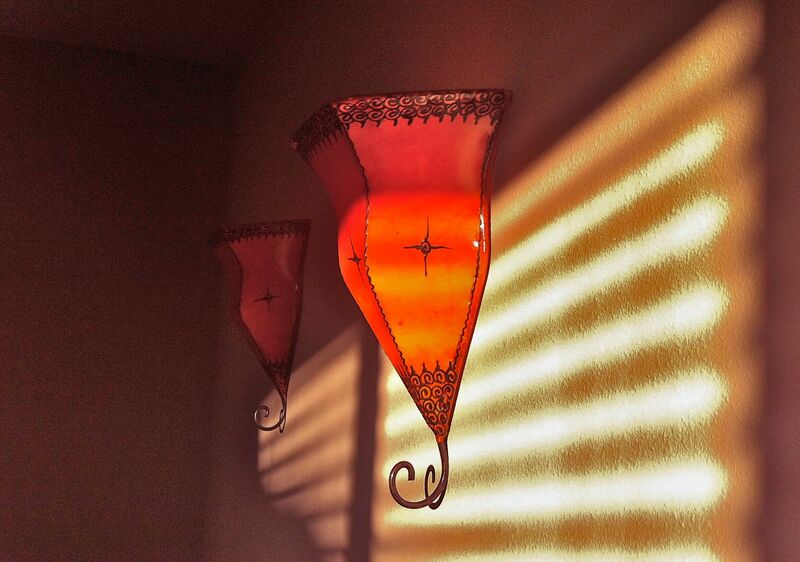 Photo credit: Naj Haus. Was thinking of you just the other day and wondering how you were and how your beautiful little house is coming along! And here you are…a ‘little’ beat-up and just as wondrous! Onward! Glad you’re back. Thanks, Kath – very nice to hear! Thanks for sharing all your experiences. Where did you get the wool insulation from? 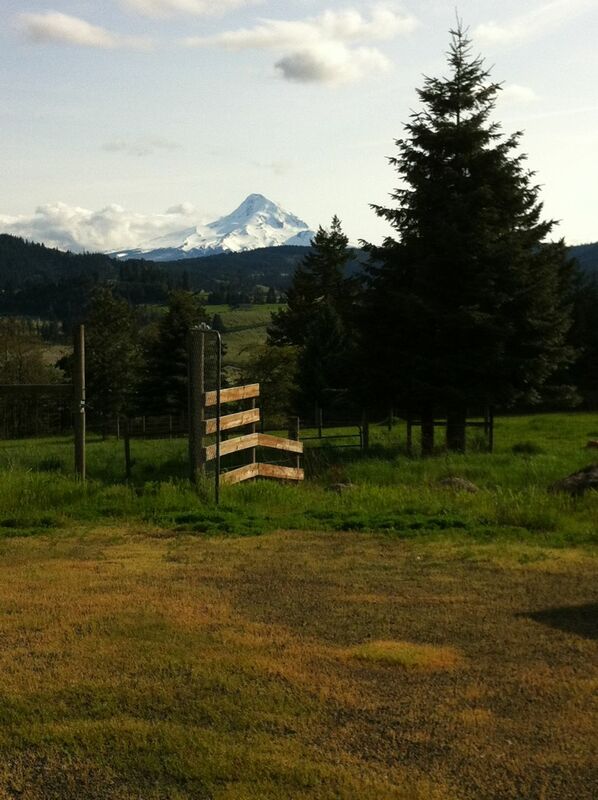 Hi Bob – it’s from Oregon Shepherd. I think it is rare to find blogs that have such organized and sincere poetic expression. Thank you. What a pleasure to read this morning. I’m happy to have found this little spot on the web, and I appreciate you taking the time to share your experiences and thoughts with others (like me!) to see. Very kind words indeed, Dominique; thank you for taking the time to pass them on! I’m happy to hear the blog resonates with you. While I try to pass on building tips and lessons, what really interests me about this endeavor is what I’m learning about myself, the world, and our place in it. I think we can all use a reminder to keep an eye out for the magic and poetry that happens in the interstices when we slow down a little. It may be a little while before I get the next post up but it will happen when it happens! Thanks, Bob! I hope your caravan becomes everything you want it to be. In my ever-expanding quest and unquenchable thirst for tiny house stories, I discovered you, Kate, and I’m thrilled that I did! 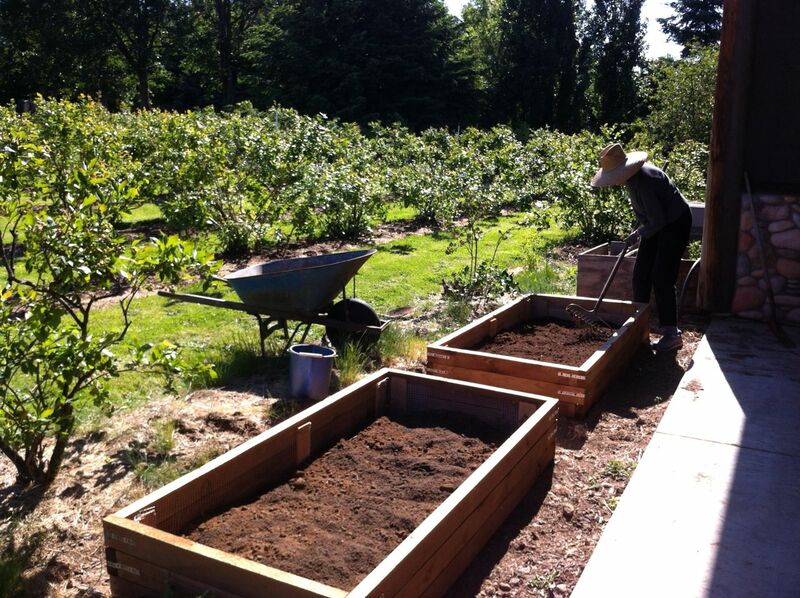 I share not only tiny house love, but sustainable and slow living, poetry (haikus or freeform for me), growing food, aging, and passion for simple, artfully crafted wood furniture. I will delve into your archives for now but do very much hope to read some new posts of your tiny journey soon. Thank you Kate, your posts are like a soothing waterfall of soul and patience and healing. I feel very connected to this one and so glad I just found your blog again. I’m in my marathon of patience with healing my back and my foot, and your words inspire me and help me feel connected to you and all of us finding our healing and winding path in this beautiful world. Much love to you and your big healing and tiny house and to the trees! I just love the google translator poetry! Hi Marilyn – so good to hear from you! I’m glad you connected with the post (though sorry to hear you’re still dealing with your injuries). Finding patience with healing, especially when you’re so used to being active, is definitely a challenge. Sending you lots of good healing juju. Be well!